Settling in on our minibus for the trip back to Havana, I see on our itinerary that our next stop is “Project of Sustainable Agriculture and Food Production Pelegrín.” I figure that we will see another organic farm like the ones we’ve visited over the last few days. So wrong! Here’s our driver Nafal relaxing on one side of the front porch of the Pelegrín house, and a shot of the even more exuberant other side. More going on here than agriculture! But before we explore the other surprises of Pelegrín, let’s take a look at the gardens. The raised beds of vegetables contained by borders of roof tiles show us once more that the production of beautiful food can itself be beautiful. 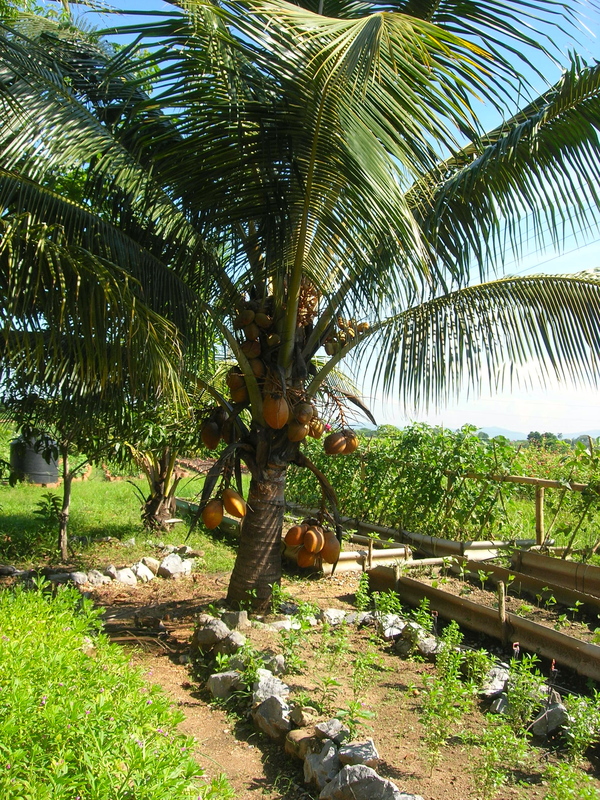 Close by, we find a coconut tree weighted with fruit. Would you like to try it? Oh, yes! 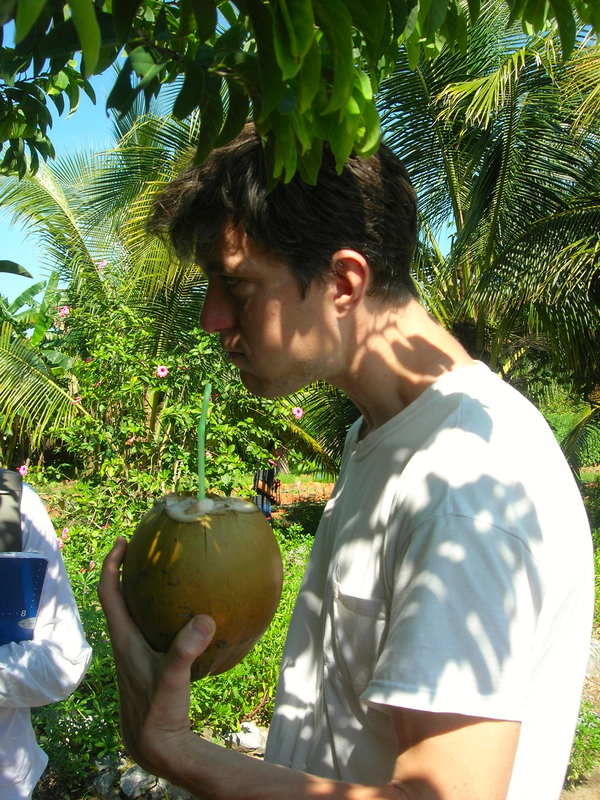 Suddenly somebody is up the tree, and the next thing we know, a machete is out, a hard nut has been topped for each of us, and we are sipping coconut water—the slightly cloudy thin liquid from the center of the fruit, with its fresh herbal fragrance—right from the shell. Here’s Alex enjoying his. 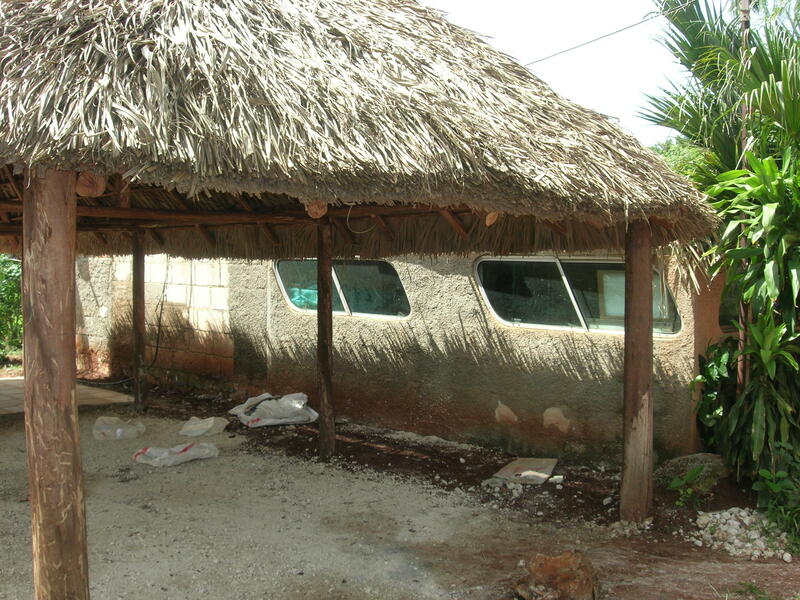 We return to the central cluster of walkways, two-story thatched cabanas, patios, and workshops. 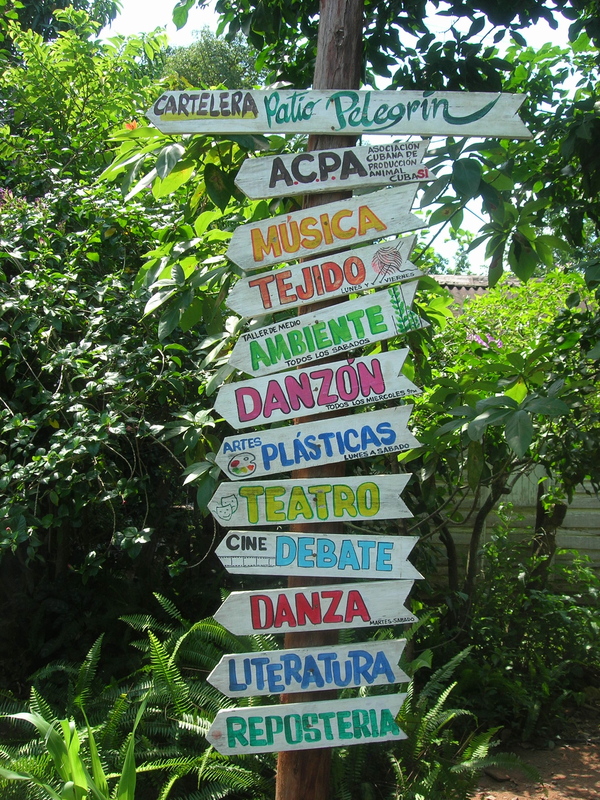 The creator of patio Pelegrín has helpfully provided signs to help us explore the compound: dance, literature, debate, music, theater— a network of workshops, nested on this small property, for local residents to cultivate their artistic and intellectual interests. Here is a group of “elderly” women (most of them appear younger than I am) practicing the craft of constructing handbags; I wish that I had gotten a picture of their product, and even more I wish that I had bought one!—They were extremely well-constructed and stylish. 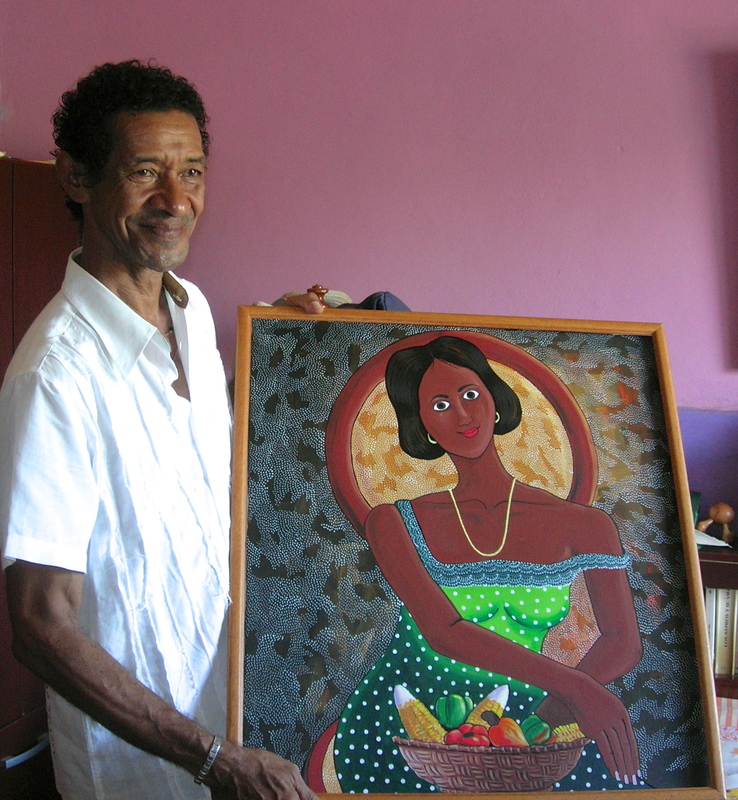 The creator of these delights (he would insist that it was a local community effort) is Mario Pelegrín Pozo, painter, ceramic artist, and cultural promoter, shown here with one of his own works (purchased by one of us, I should add!). 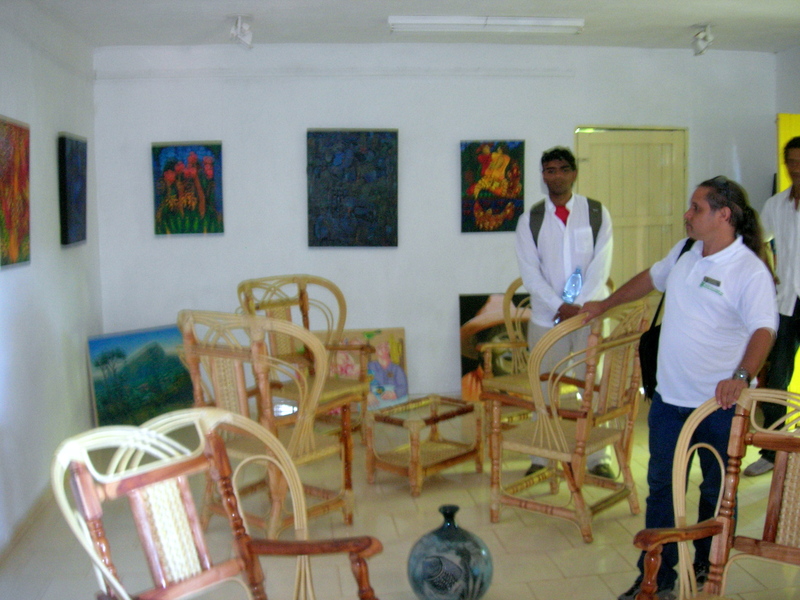 We lingered in the gallery with its paintings, ceramics, and handmade furniture. See that painting over Raj’s shoulder?—it will soon be hanging over my desk! (I’ll tell you more about Raj in a future post, but for now, check out Generation Food Project, his current movie project with Steve James, director of Hoop Dreams.) We relaxed over a cup of coffee in the café literario. 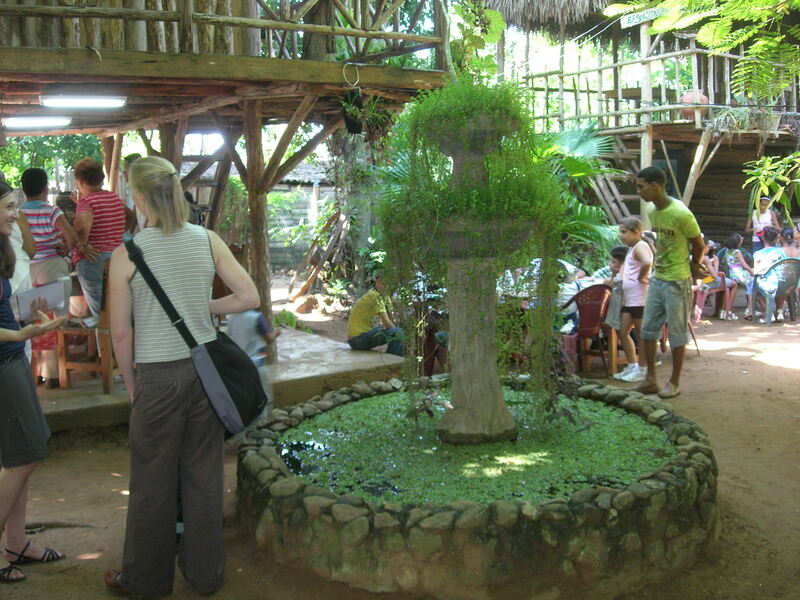 We wandered around the grounds taking in the maze of artworks and thatched structures. I wish I could spend more time with you exploring the birdcages and rabbit pens, the grain mill, the visiting hawk who hangs out on the front porch, the fountain, the well, the rescued alligator in his hog-wire cage (big!—soon to be picked up for a return trip to the wild). But it is time for lunch! And what a lunch. It will be a while, here at home, before I can really enjoy an avocado, or a mango, or a banana; the exotic warm aroma and rich flesh of the just-picked fruit still has me seduced! After our morning’s dalliance in this magical place, we aren’t easy to organize, but eventually Zoe and Jesús get us back on the bus headed for Havana, where we meet with Juan José León from the Ministry of Agriculture. Sr. León is a crisp antidote to our morning’s artistic meanderings; a small farmer turned revolutionary, he has a long memory and a ready command of facts and figures. He sketched in for us, through the eyes of the farmers, the tumultuous early days of the Revolution in 1959. The agrarian reform laws of 1959 nationalized and redistributed large land holdings—those owned by Cubans (including the Castro family, by the way) as well as those owned by foreign individuals and companies—but allowed each owner to keep 400 hectares of land. 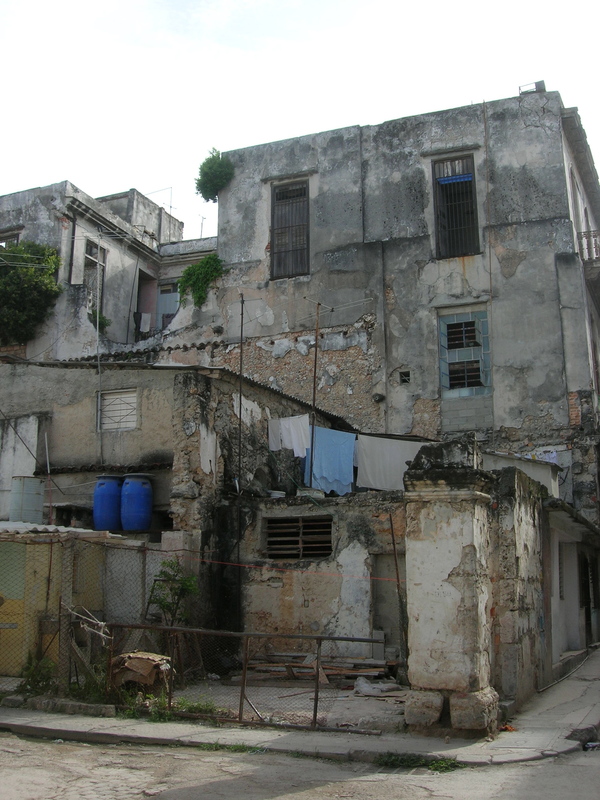 (The seizure of property owned by American citizens led the U.S. in 1960 to impose the embargo on Cuba that continues to this day.) Small farmers were allotted the land they were working, up to 67 hectares. (Why 67?—It turns out that there’s a measurement larger than a hectare, a “caballeria,” which consists of about 13.4 hectares. So, five “caballerias” equals 67 hectares.) Also, over 100,000 other families received at least one hectare (2.5 acres) or more. About 60% of the nationalized land remained in state hands and about 40% was redistributed to land-owners and small farmers. But, he said, the large land-owners didn’t take advantage of the 400 hectares they were allotted, and instead of farming, conspired against the Revolution. So in 1963 the state nationalized those 400-hectare plots as well; 80% of this land was held by the government and 20% was distributed directly to farmers. The state organized the lands it retained into the large state farms that we have heard of before, worked by farmers as employees of the state. (After the fall of the Soviet Union, these farms would be broken up into the UBPCs like Alamar that we visited on the first day, which hold their lands “in usufruct”—basically, a long-term lease—from the state.) Of the farmers who became land owners, some chose to consolidate their lands with others to form a cooperative. (In this case, they gave up individual ownership by selling the land to the cooperative and becoming a share-holder in the coop.) 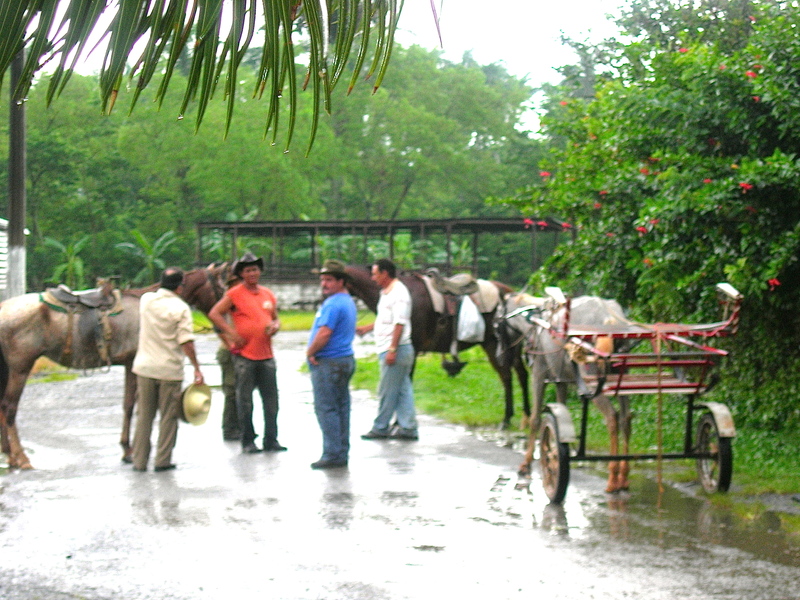 Other farmers retained ownership of their land but formed cooperatives to work together on the logistics of farming (like El Paraíso that we visited on day five). The “revolutionary process” of land distribution continues; new laws passed in 2008 created a means to redistribute unused or poorly administered land. A farmer or coop can now get a 13-hectare grant of such land (more or less a “caballeria”), and can ask for even more, up to 40 hectares. But how do these people sell their crops? Sr. León explained that the state purchases 100% of “trade” crops like tobacco, cacao beans, and coffee. In addition, farmers are required to sell 80% of certain categories of produce to the state, but can sell the remaining 20% on the free market. The restricted categories cover 21 products: among tubers, for instance, malangas, sweet potatoes, yams, and potatoes; in vegetables, onions, garlic, pepper, cucumber, and tomatoes; in fruits, mango, guava, citrus, papaya, and pineapple; in grains, rice, corn, and garbanzos; and in dairy, milk. There’s a lot on this list! (The state’s 80% of these products covers what Sr. León calls “social consumption”—the needs of hospitals, schools, day-care centers, old-folks homes, etc.) For products not on the list, farmers can freely sell whatever they produce. Also, farmers can contract to sell directly to tourist operations like hotels. But it turns out that small-scale urban agriculture operates outside this system. 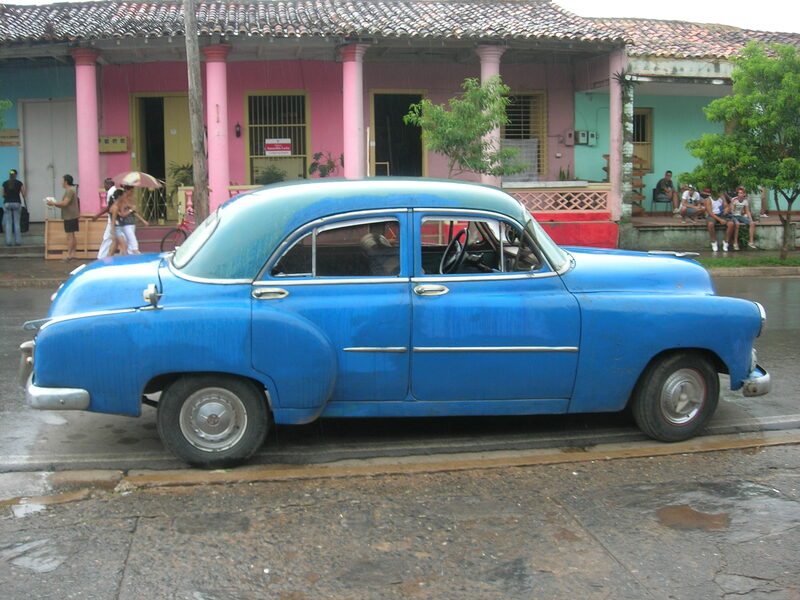 (Lots of exceptions!—It appears that Cuba is trying any number of different models these days.) Growers who live within a 10-kilometer radius of a city can freely sell 100% of their produce. Tomorrow we will visit a bursting handful of gardens like these. We have had a long day!—But we have one more stop before we head back to the hotel: the Food Conservation Project “Vilda and Pepe.” For fifteen years now, the couple (Vilda trained as a chemist in animal nutrition, Pepe as a mechanical engineer) has been working tirelessly to teach Cubans how to preserve food. Remember that, when the Soviet Union disintegrated starting in 1989, within two years Cuba had lost its main trading partner and 80% of its trade—trade that included much of the Cuban food supply. 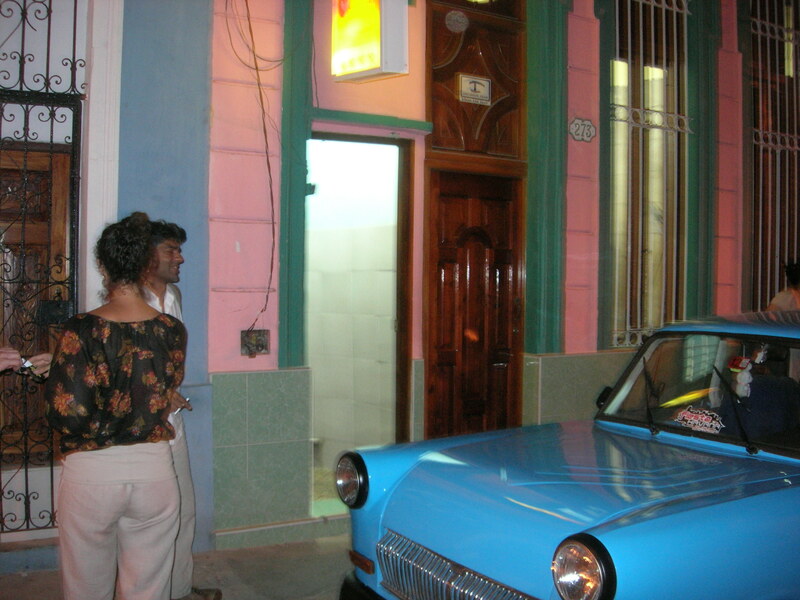 Vilda gave us a vivid picture of the impact of this loss on the Cuban dinner table. 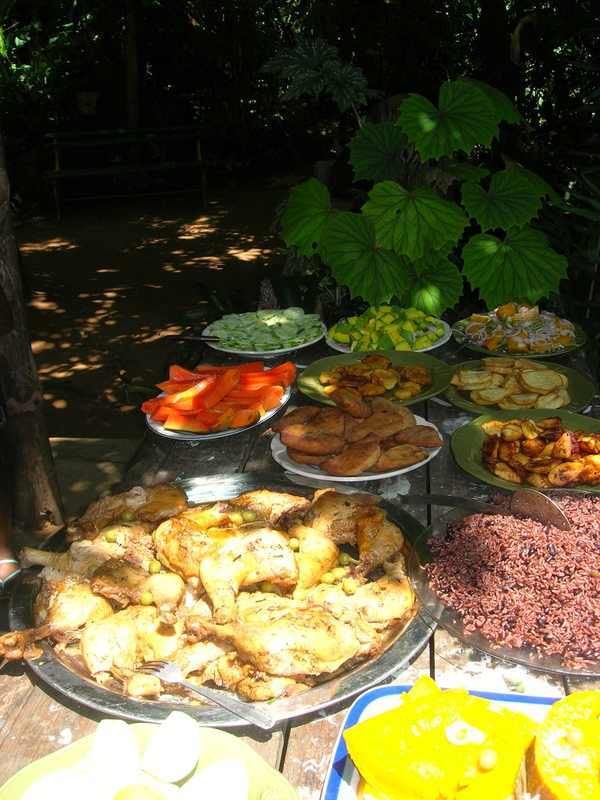 The calorie intake of the average Cuban adult fell from about 3,000 calories a day down to 1,800 a day. Protein intake dropped from 90 grams a day to 45. During this harsh period, Vilda and Pepe drew on their backgrounds in nutrition and engineering to learn how to preserve food for themselves, and then decided to share what they had learned in their own kitchen. 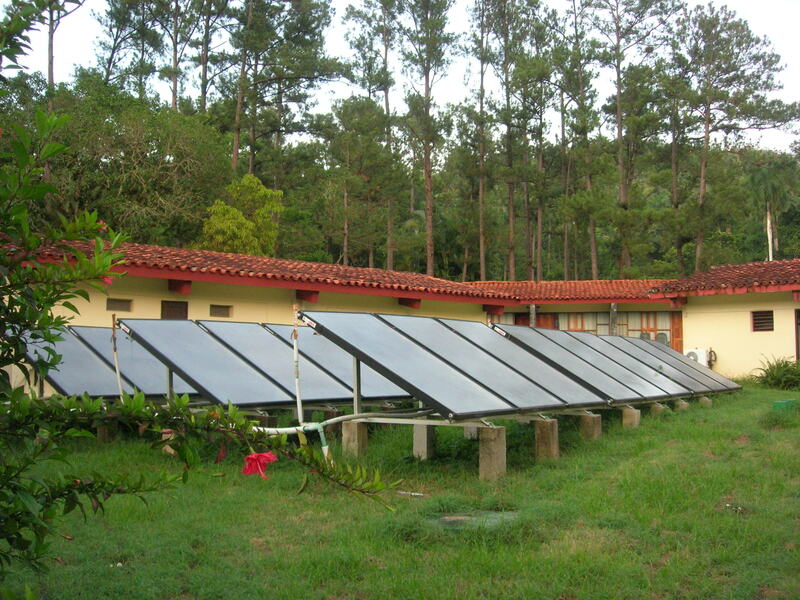 They use natural techniques and methods that work in ordinary Cuban kitchens—solar drying a nd dehydration, fermentation and pickling in vinegar, pasteurization. 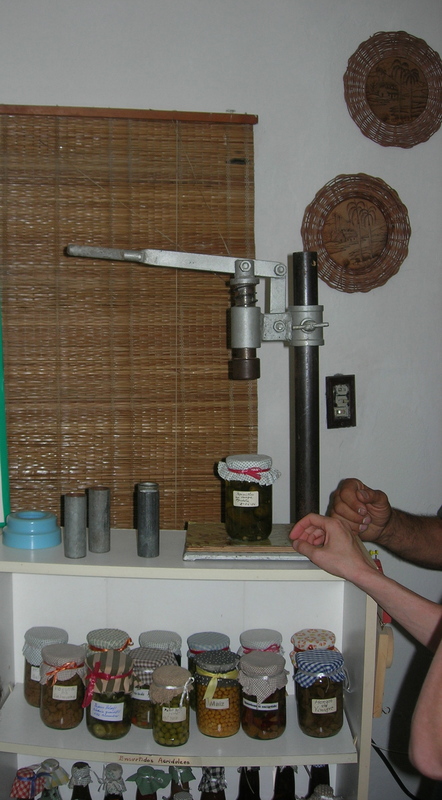 They developed a simple sterile sealer for bottles and jars from “found” materials that can by copied easily (easily, at least, by the endlessly resourceful Cuban people). 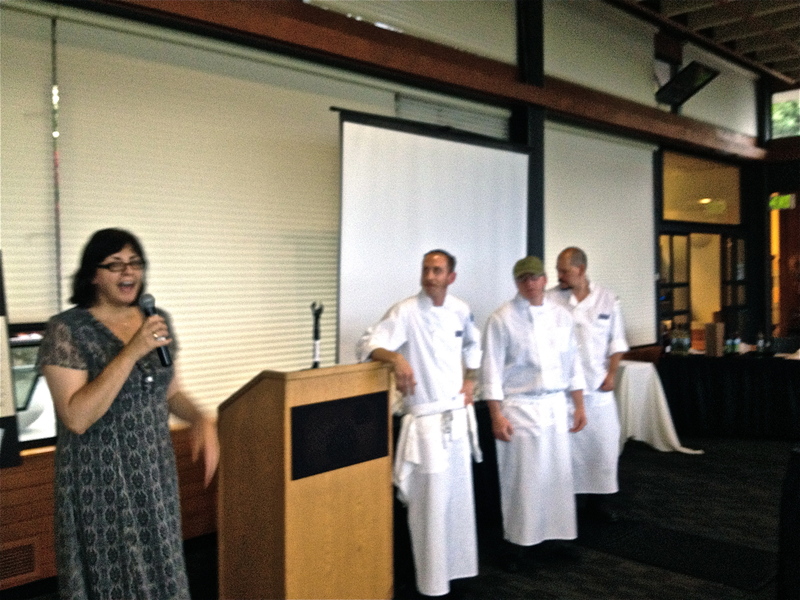 They developed tasty recipes and offered classes for housewives, kids, and food producers. Over time, they attracted funding from national and international NGOs and other sources to help them scale up their operation. Their outreach combines face-to-face approaches with extensive media efforts. Volunteer “promotores” take the participatory training and then fan out into the community to show their neighbors the techniques; children come into their “test kitchen” for classes once a month, learning hands-on how to prepare healthful meals and preserve produce from their family gardens. Vilda and Pepe also have created something of a media empire—they have a weekly half-hour radio show and a publishing house that distributes their books and multimedia products. They now reach 15,000 people face-to-face, and over radio and TV, about 1.5 million people per year. Their services are free; the media sales help fund the organization. Their efforts allow farmers to add value to their produce and enable people to enjoy seasonal foods like fruits across the year. And remember that Cuba lies in the middle of “hurricane alley”—in 2008, for instance, they had two hurricanes within two days that destroyed over 750,000 pounds of the food supply. Thanks to Vilda and Pepe, many Cubans can now rely on a small pantry of preserved fruits and vegetables to help them through such crises. To learn more about their work, visit Food Conservation Project “Vilda and Pepe.” (It’s in Spanish; use “translate this page” in Google search). Today we visted El Paraíso (“paradise” in English), a family farm terraced along a hillside overlooking a valley checkered with pastures and more farms. 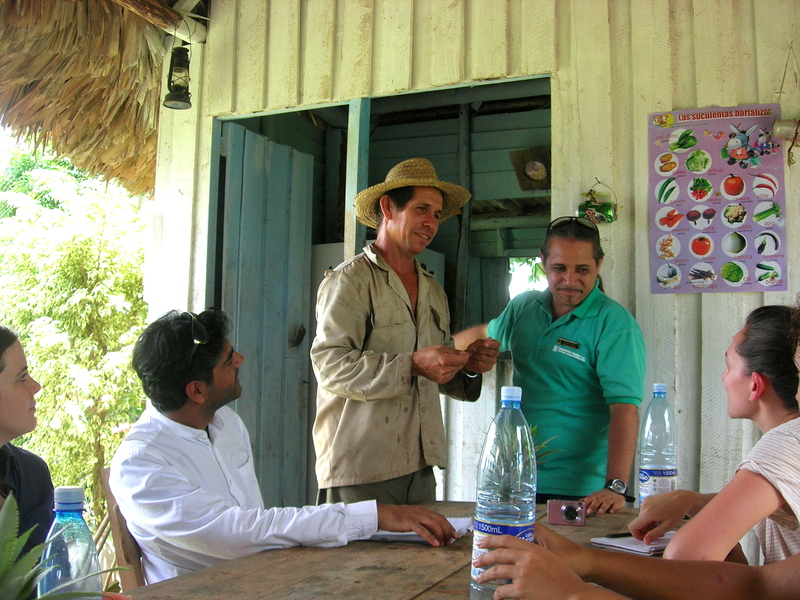 Here Wilfredo, the head of the family, welcomes us, translated by our trusty Jesús. (I didn’t get Wilfredo’s last name, unfortunately.) You may remember that a few days ago we visited Alamar UBPC (“basic unit of cooperative production,” a farm on state-owned land run by a cooperative of workers). El Paraíso on the other hand is a privately owned family farm, organized with others like it in a private “credit and service cooperative” (the acronym in Spanish is CCS). 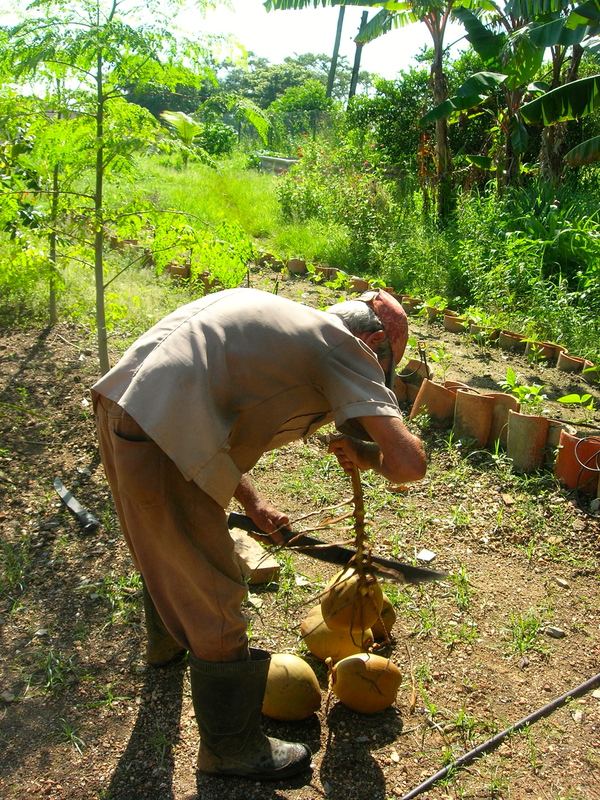 CCS farms have grown to represent about 17% of all Cuban farms. 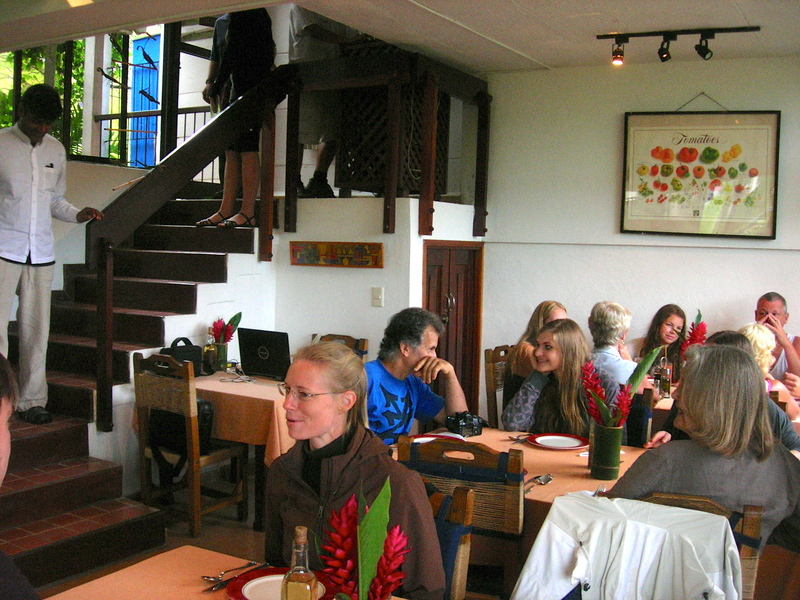 El Paraíso is also a Finca Agroecologica education center and demonstration farm. The terraces stepping down the hillside, bordered and contained by hand-stacked stones, are silent testimony to the time and labor that it takes to draw these orderly ranks of crops out of the land. 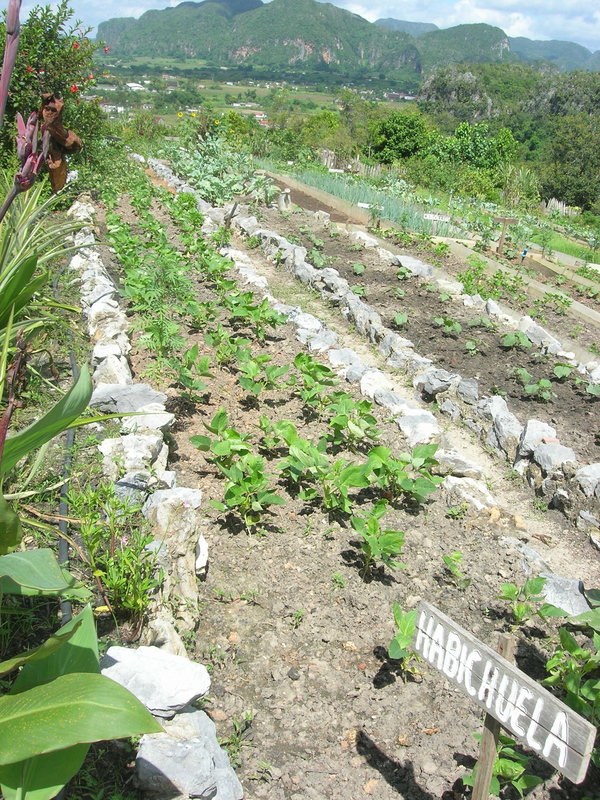 Here we see a row of habichuelas, a long flat green bean; the interplanting in this field includes scallions, squash, and several other vegetables, as well as bright flowers (to attract pests away from the crops). Drip irrigation keeps the crops healthy with as little water as possible (no mean feat in this very hot climate). The son-in-law of the family, Tony, took a moment on our tour to show us some of the older tools still in use on the farm. 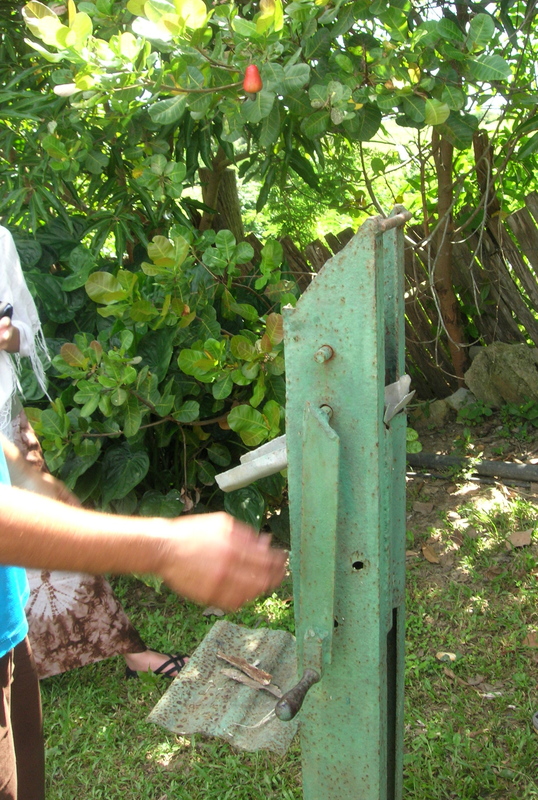 The sugar-cane shredder, constructed from bits and pieces from a tractor and a couple of other sources, reduces the knife-edged sugar-cane leaves to pulp and channels off the juice. The coffee-bean husker (a ubiquitous tool in Cuba, it turns out) breaks up the outer husk to release the coffee bean. (At one point Jesús—a formidable dancer—showed us a dance move based on the action of pounding the coffee beans with the pestle of the husker. Where was my camera!) 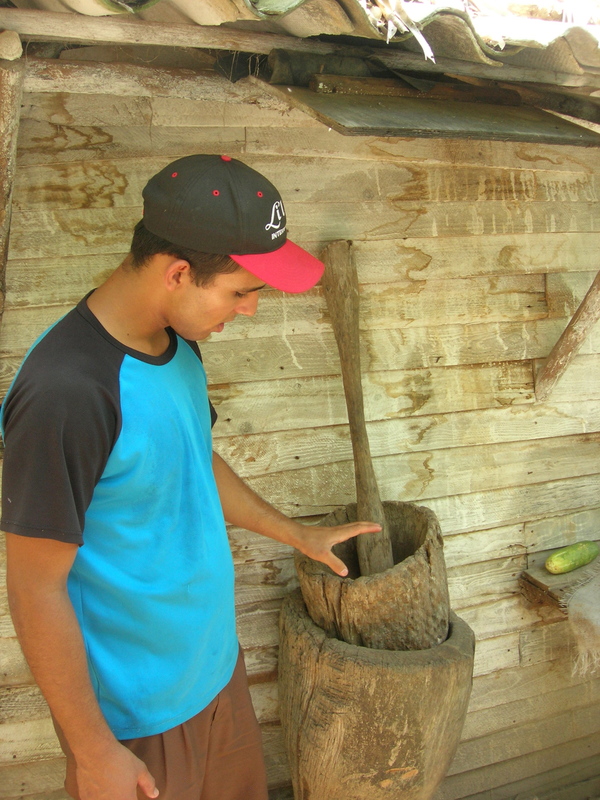 And Tony showed us how to operate the hand-mill, used to grind corn and other grains. These tools, like the terrace rockeries and the thatched roofs of the cabanas and outbuildings, show me once again how the Cubans manage to create both grace and utility out of just the materials they have on hand. After a delicious lunch on the farm, we headed off to the headquarters of the Moncada UBPC, where we talked to Rafael Barrios, the head of production for the farm. It was pouring rain once again!— Here we see some members of the cooperative, using probably the most efficient modes of transportation for the weather. Unlike the Alamar UBPC that we visited earlier, with its diverse crops of vegetables and herbs, the main crops for external trade here at Moncada are the traditional ones of tobacco and coffee. Of its 204 hectares, 42 are devoted to coffee and 42 to tobacco; 64 hectares are devoted to “self-consumption”—essentially, gardens for the families of the 86 associates who make up the coop membership—and the rest is left in uncultivated woodlands, where they raise animals. 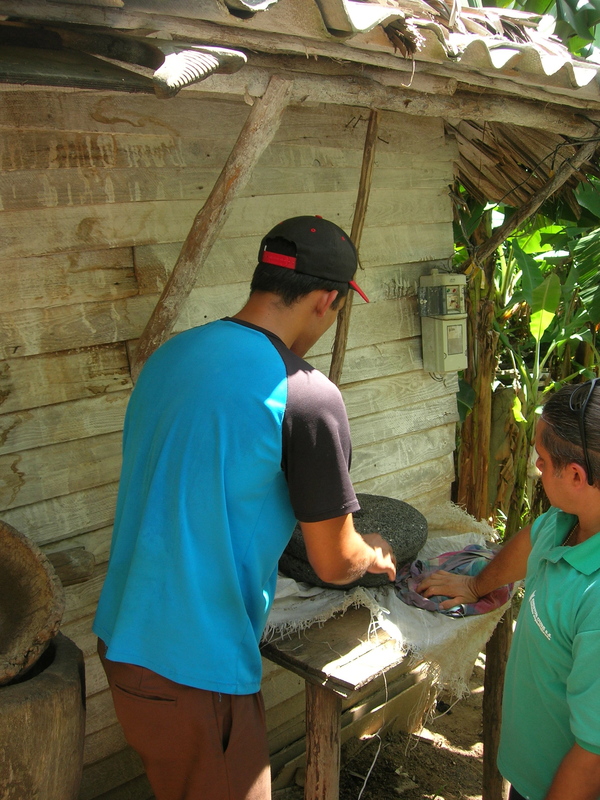 In addition to selling under contract to the government, they can sell some of their products to people outside the coop, and sometimes family members supplement the family income with jobs in the town. 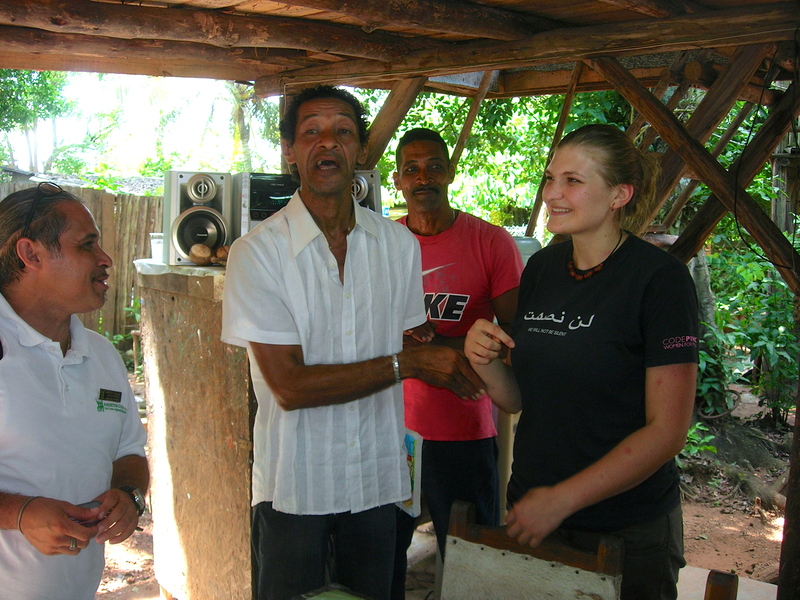 Sr. Barrios helped us understand better what it was like for the farm workers to go from employee to coop member. Like Alamar, the Moncada UBPC began in 1993 with the breakup of a large state-owned farm, and the workers on that farm became the associates of the UBPC. Moncada also holds its lands in usufruct (essentially, a long lease) from the state. The biggest challenge in the transition, he said, was that before, the government answered for everything, but afterwards the workers had to organize themselves and manage their own operation. With the right to own, if not the land itself, the means of production as well as the fruits of their labors, Sr. Barrios said, the workers now feel like true owners. As part of their annually negotiated contract with the government, the coop buys a “technological package” that includes everything (down to machetes!) needed to develop the crops, and crop insurance as well. Over the course of the year they keep track of costs and production levels, and after the harvest, more productive members get a larger share of the sales proceeds. The farm has done well and is always growing. I admire the energy and intelligence of everybody we’ve met at the UBPCs—but the Texan in me balks. Am I hearing whispers from one of my stubborn peasant forebears? 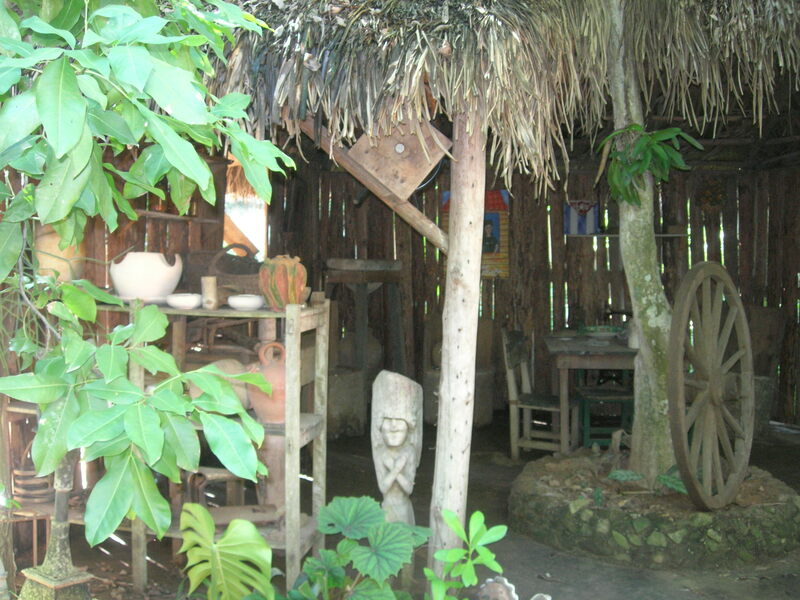 Do I have a primal fear of being turfed out of my hut by some inscrutable landlord?—I would want to own my land. 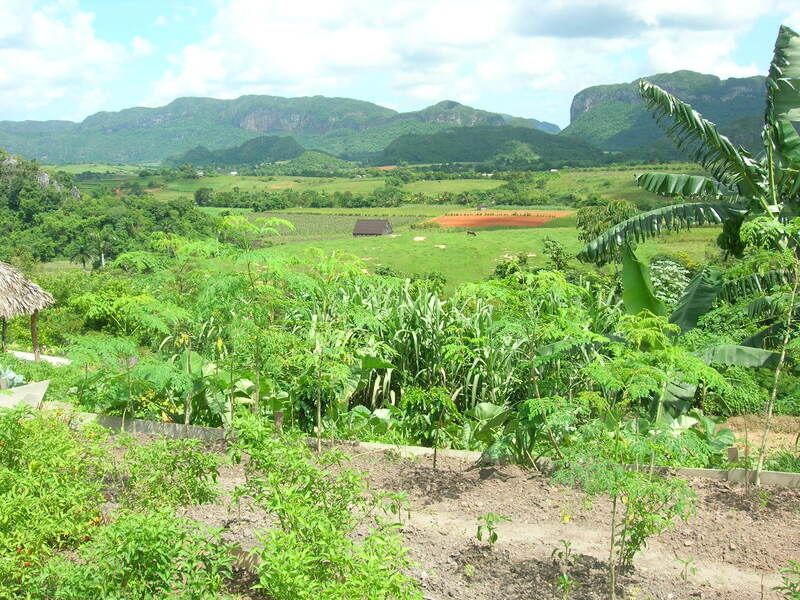 Thus I was glad to discover that the Cuban system, among its several models, has a place for private family-owned farms like El Paraíso. On our way back to the hotel at the end of the day, we stopped briefly in Viñales, where I caught this classic car parked in s street-scape of lovely rain-washed colors! Today we set out west of Havana to Las Terrazas to visit the Biosphere, a UNESCO biological reserve. What beautiful countryside! We arrived at the eco-station just in time to be pelted by rain, but we were able to ignore it with the help of a drink, some Afro-Cuban music, and a fact-filled introduction to the reserve. The scientists at the reserve are working to repair ecological damage done over centuries. In the colonial period, coffee growers stripped the area of its forests to develop their vast fincas; now the scientists are replanting with over 130 species of native trees and other vegetation. They also have fish farms that support 21 different species, 13 of them native to the region and two found only in the reserve. They also are working to build agro-biodiversity. 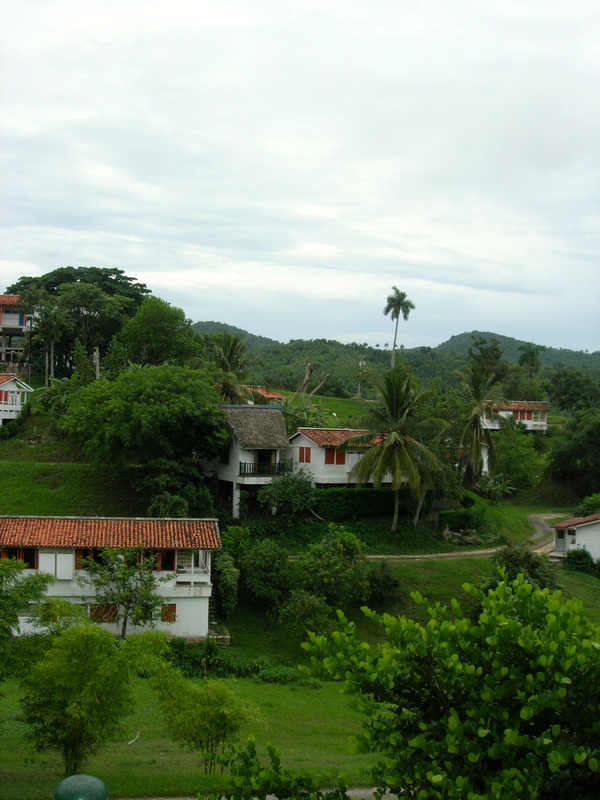 The farmers in the reserve live in the village of Las Terrazas (constructed for them when the reserve was created) and have farm plots in the surrounding hills. They contribute seeds from their crops to a strictly controlled seed bank and exchange seeds both among themselves and with farmers in other regions. The scientists keep track of the farmers who are growing indigenous crops following traditional techniques and make sure to collect seeds from them. 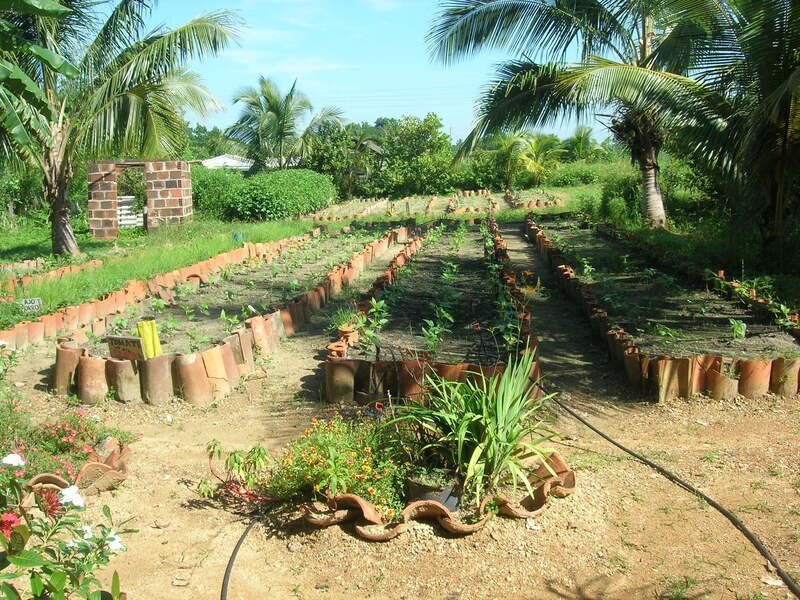 The seed bank ensures that these crops can be planted year after year, and provides resources to help repair the crop damage done by hurricanes and other natural disasters that lash Cuba. Once again, we found that these agro-ecological practices had a human heart and social mission. The project “Mi plato y yo” (“My recipe and myself”) collects recipes, often handed down from grandparents to grandchildren, of indigenous foods prepared in traditional ways. The published collections tell the stories both of the dishes and of the cooks who contributed them—a great way to celebrate the traditions of Cuban food preparation and tempt cooks to try the techniques of these elders in their own kitchens. 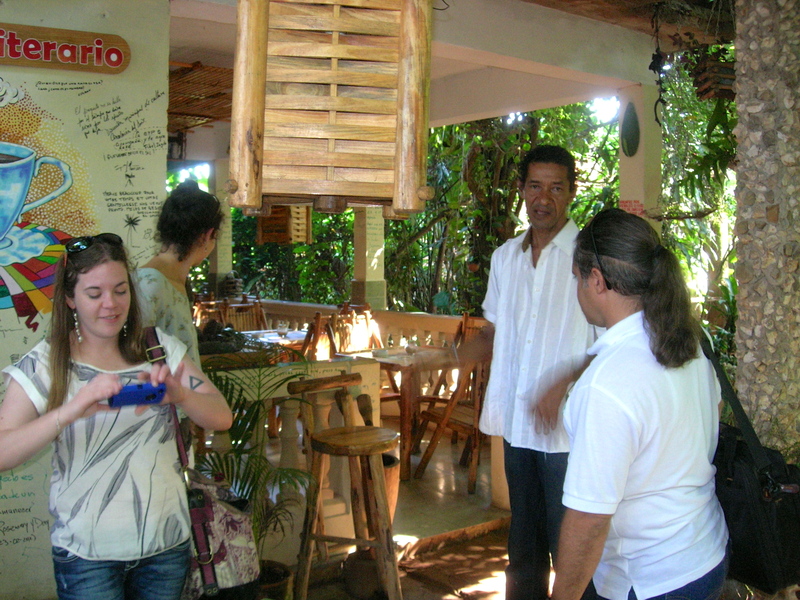 Time for lunch!—We wound our way through the village to Eco-Restaurant El Romero, “gourmet of the Cuban ecological cuisine.” This improbable gem is the brainchild of Tito Nuñez Gudás, vegetarian chef, forager, and food artist (seen here against a backdrop of the wetlands and fields where he forages many ingredients for his menu). We started with pickled lotus root, fresh and delicate. Following that, we had soup (several different kinds for each table; mine was a lovely brothy vegetable soup, and others had cold pumpkin soup or black bean soup). 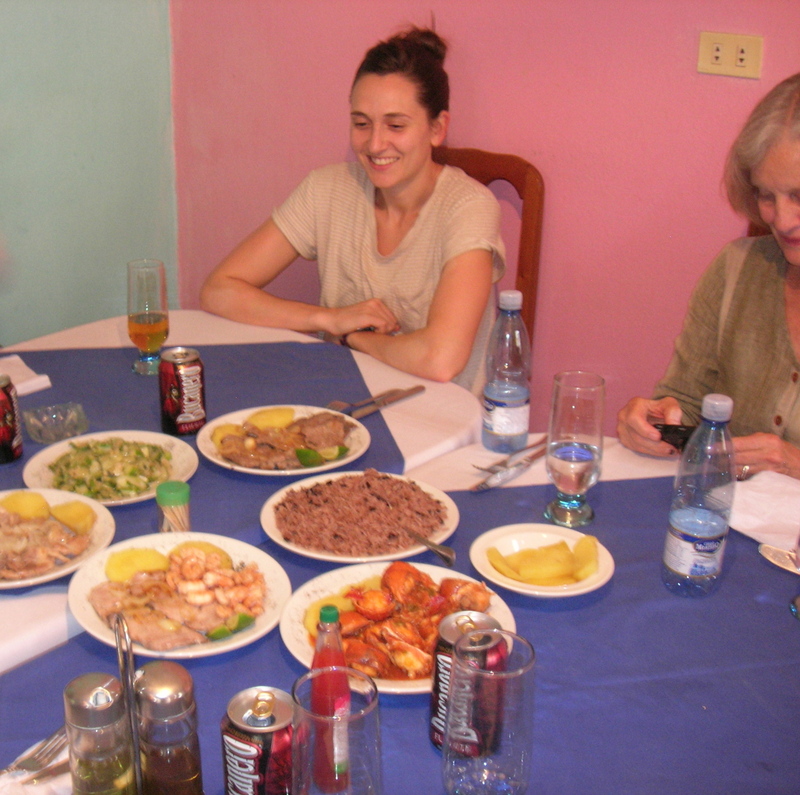 Our main-course plates were a buffet unto themselves —a torta, herbed brown rice, a taco, several kinds of vegetables, all artfully plated (my notes are a collection of superlatives barely readable through splashes and smears of the meal itself). 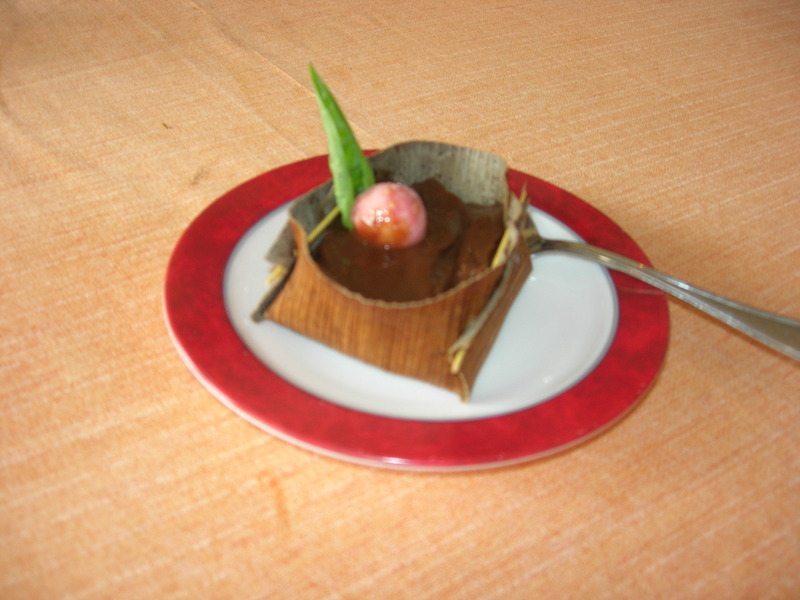 We ended on a high note with a chocolate pudding served in a little leaf boat. We puzzled over what gave it its depth and complexity but ended up having to ask: some pumpkin, some peanuts. How did they do that?—It was the best chocolate ever! 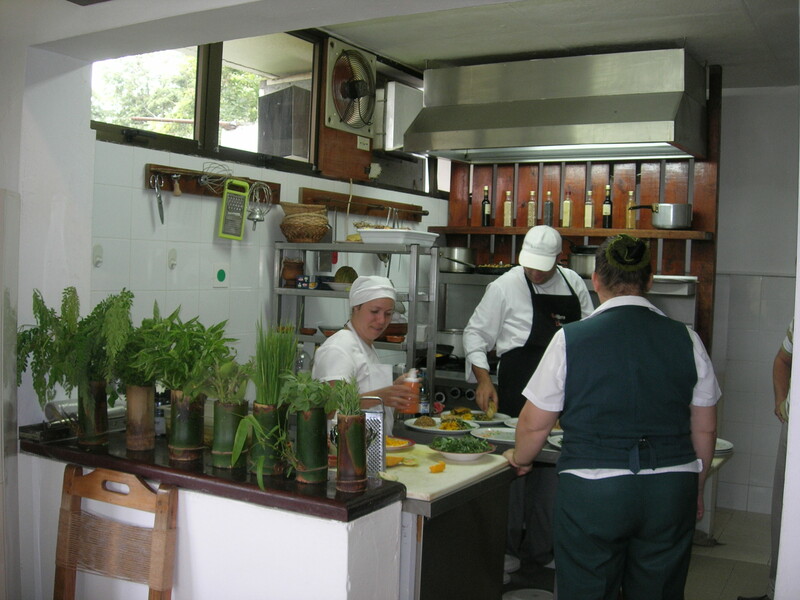 All of this carefully prepared and beautifully presented food emerged from the small kitchen in the corner with its fresh herbs and shelves of handmade condiments, where the chef and servers handily choreographed our meal. 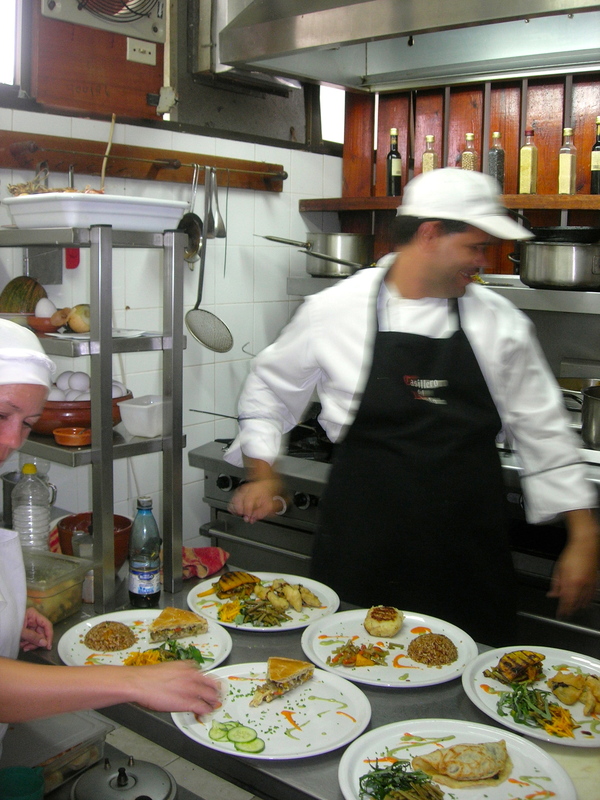 But where did Tito find vegetarian chefs of this caliber?—Locally, of course, trained under his careful eye. Describing the first reaction of his pork-loving Cuban community to meals made only of plants, he laughed as he pushed his hands away from himself in the universal gesture of refusal. But now he works with the schools to explain the fare and trains students as interns to learn the preparations. Changing the diet of his community, one leaf at a time! 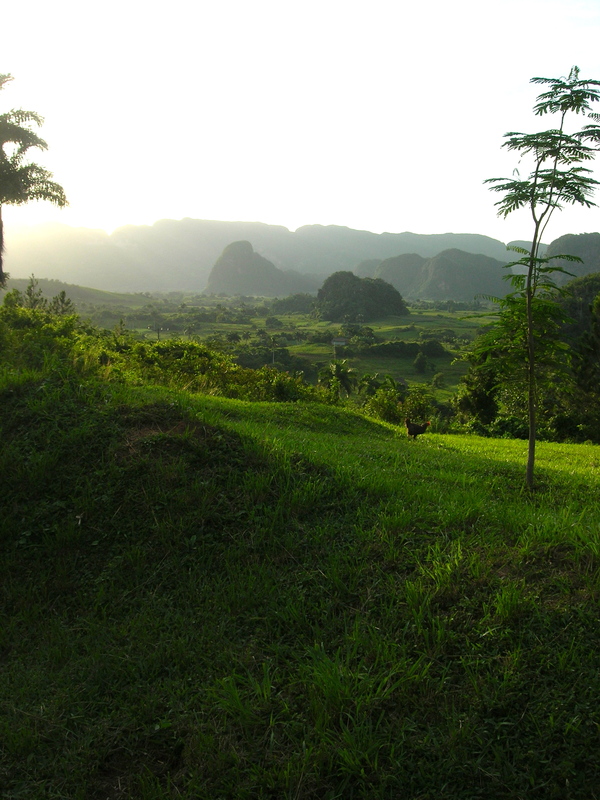 Note: There won’t be a “Cuba day four;” the cold I felt coming on today arrived copiously by night-time, and I spent the whole next day—our first in the beautiful mountain town of Viñales—in bed in a Claritan-induced smog. What did I miss?—Primarily a trip to a tobacco farm, which of everything we had on the agenda interested me the least (my swampy ex-smoker lungs would not have been amused). So, on to day five! 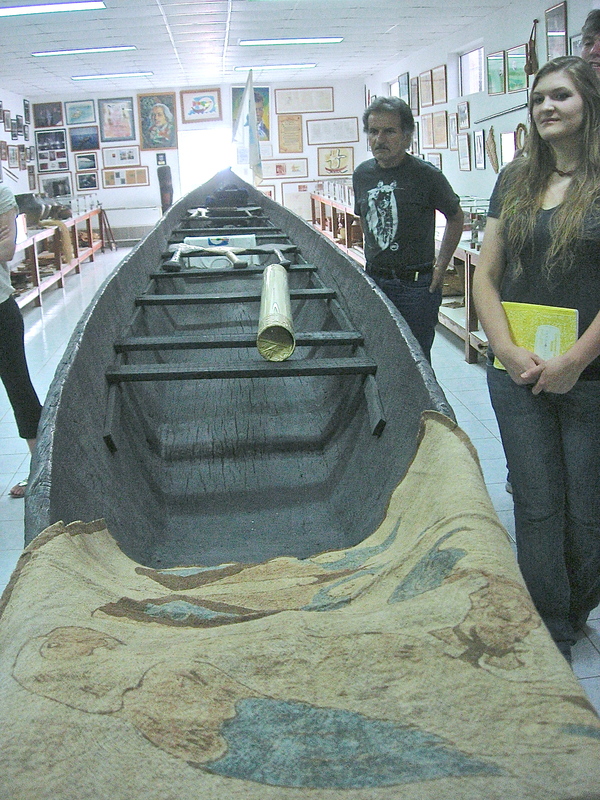 At any rate, after Handy’s tour of the foundation museum and library, we met with Maria Caridad Cruz, coordinator of the FANJ Program for Local Sustainable Development. Yesterday we had learned about Cuba’s early commitment to commodity crops (sugar, coffee, tobacco), the collapse of those markets, and the emergence of other models like farming cooperatives. 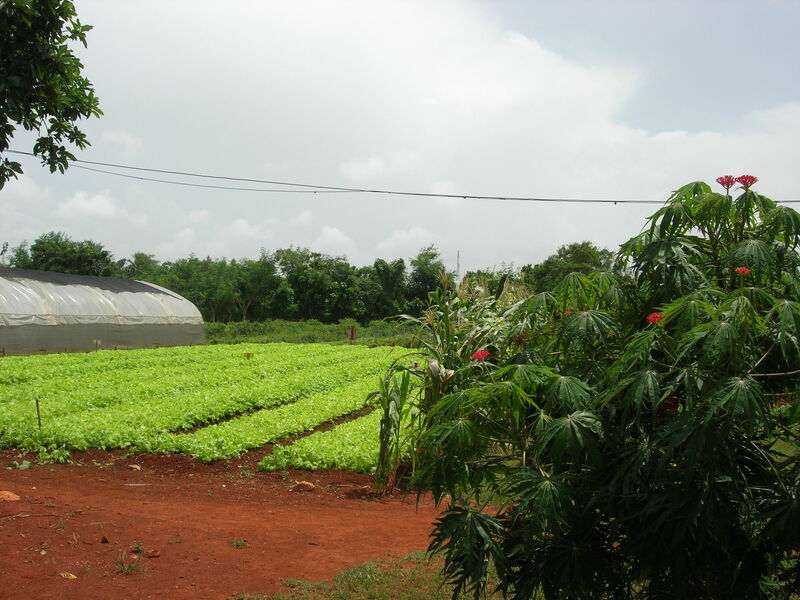 Walking through the fields of the UBPC Alamar, we had seen one example of smaller-scale, highly diversified farming. Now Maria sketched out for us the whole FANJ vision of what food production in Cuba could become. These family gardens produce vegetables, medicinal and culinary herbs, fruits, and flowers —and produce them prodigiously! FANJ also offers a program about how to sell their excess produce. And FANJ supports seed exchanges, both for family gardeners and for larger-scale farmers. FANJ’s programs are small but growing. 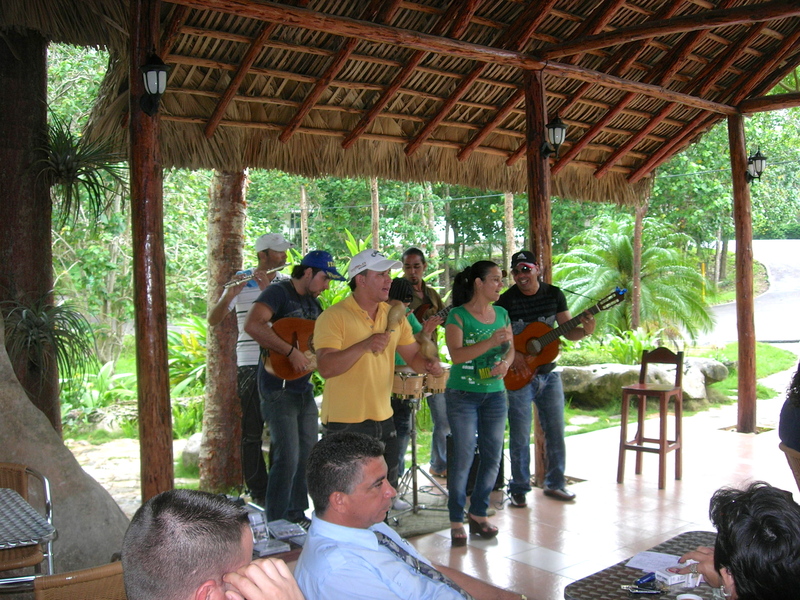 They now have 25 functioning groups in seven (out of Cuba’s 15) provinces, and they have 120 promoters (“promodores”) around the country, getting into the smaller communities with their mission and programs. But a word about the mission. Yes, they want the Cuban people to grow food to enrich their diets and supplement their incomes. But they have a broader social mission: to develop active citizens who are working together to solve problems at the local level. They aim to involve whole families (farming has historically been a male occupation), and to encourage people to have a lively Interchange about their practices, their problems and solutions, and their dreams. I will return to this theme later; I came to realize by the end of my trip that it was really the cornerstone of what I was learning in Cuba. 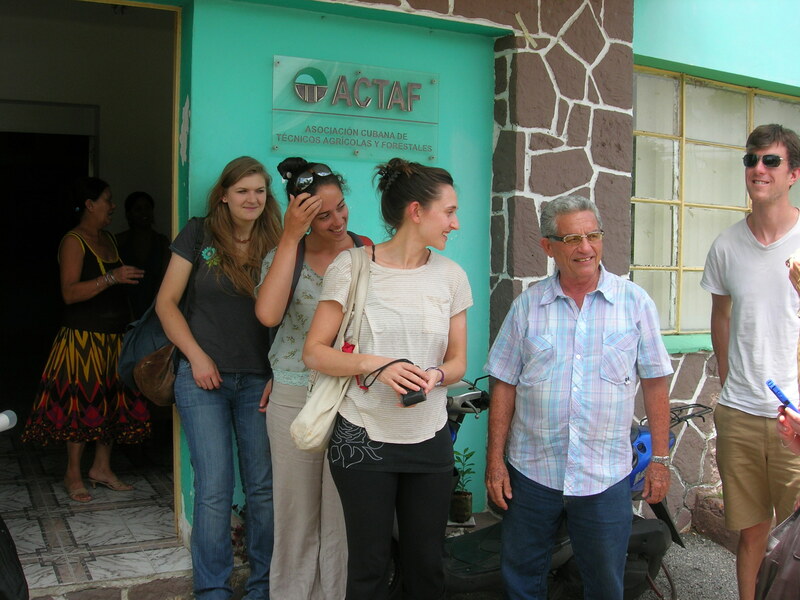 Next we visited the Cuban Association of Agricultural and Forestry Technicians (ACTAF) where we talked to Fernando Funes, the Coordinator of Agro-ecological Projects. 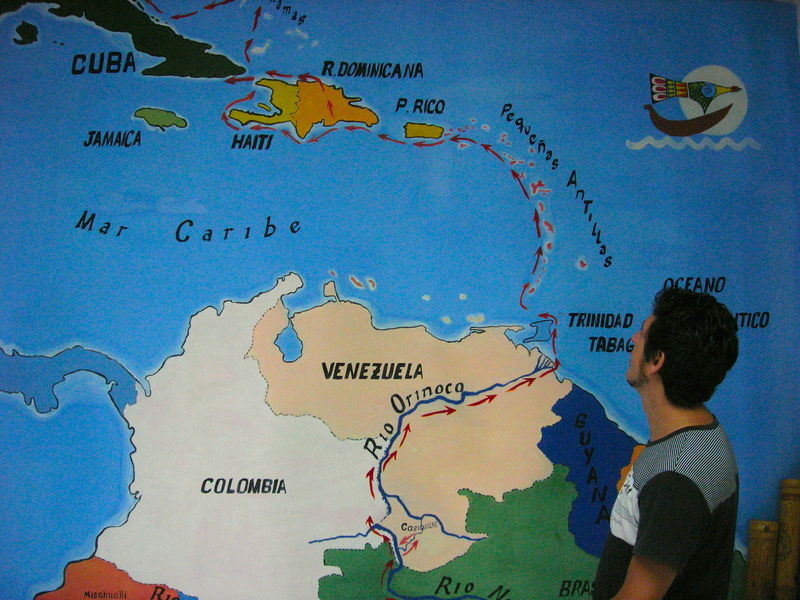 Fernando took us on a personal journey through the landscape that we had been visiting. At first his agricultural education had been very specialized, in the spirit of the Green Revolution; he studied pastures and cattle exclusively. Then the blow fell: the USSR collapsed. He likes statistics; he mentioned that during the early part of the Special Period, 100,000 cattle died. He added that he himself lost 25 pounds. (This is not a large man.) People felt the raw fear of not being able to feed their families. At that point, people began to adopt early forms of agro-ecological techniques. They kept poultry, pigs, and honeybees; they applied biological fertilizers and manures, used nematodes, minimized fuel usage, and more. They incorporated small animals into their food system, using plant byproducts to feed the animals and animal byproducts to feed the plants. He led the way in incorporating forestry systems and pasture systems into overall food production, use of inter-crop planting, and so on. At the beginning of the process, he told us, it took eight units of energy to produce one unit of food; by the third year, it took only three units of energy to produce four units of food. We will revisit many of these themes, and see wonderful examples of these processes at work, over our remaining days. 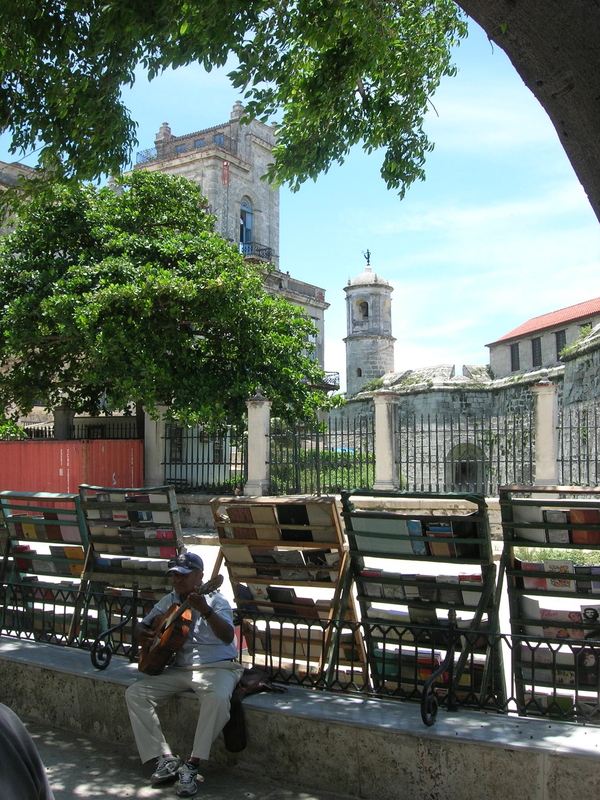 But we also took some time in the afternoon to savo r beautiful Havana! 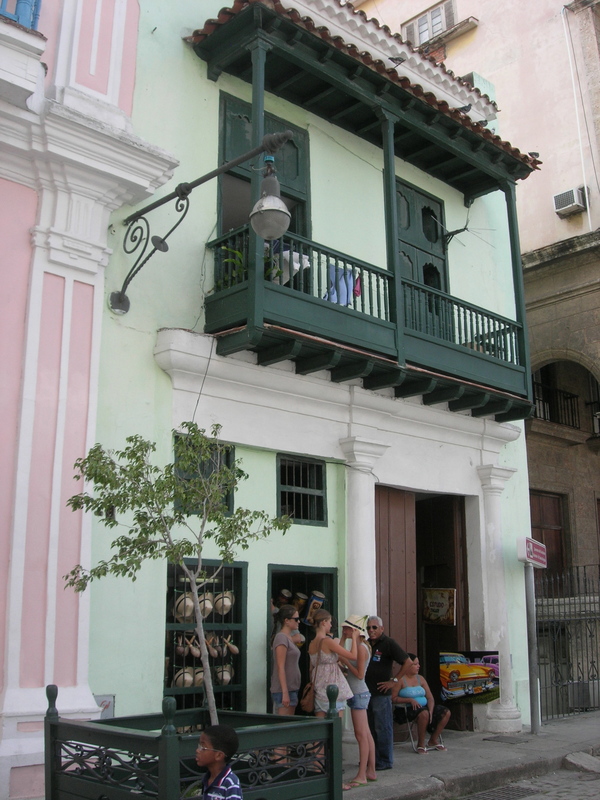 We first walked through the Plaza de Armas, with its graceful spaces. 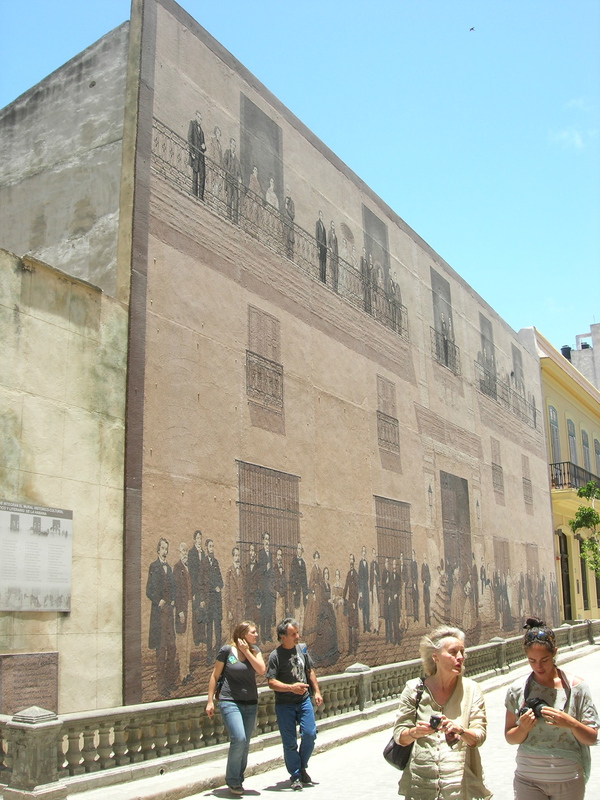 Then, on the way to the Plaza de la Catedral, we passed a building that was unfinished, but its blank concrete facade had been brought to life by a mural of the society of Old Havana. And finally we visited the plaza of the cathedral, with its beautiful facade speaking of the centuries of Spanish life that had unfolded here. Hemingway, Fidel, Bay of Pigs, the missile crisis, Venceremos, Marielitos, Elián—the threads of so many stories of Cuba are woven through the fabric of my own life! 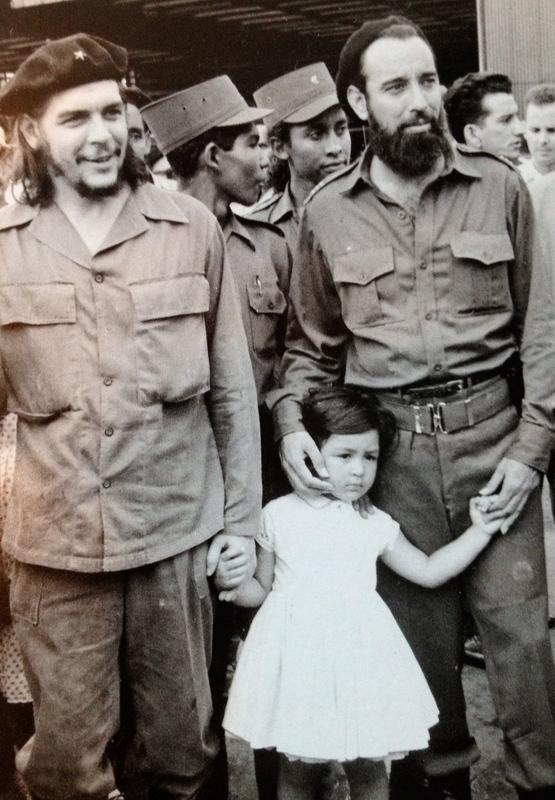 I was just eleven years old, catching my first glimpse of a world wider than Kingsville, Texas, when on New Year’s Day 1959 Batista fled the country and Castro’s revolutionary forces took over. 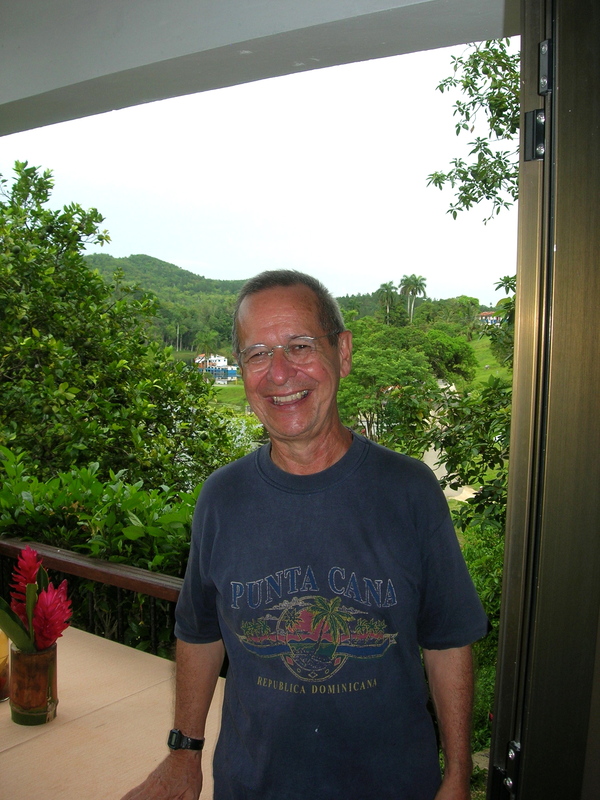 And now, more than a half-century later, I have finally visited beautiful Cuba. 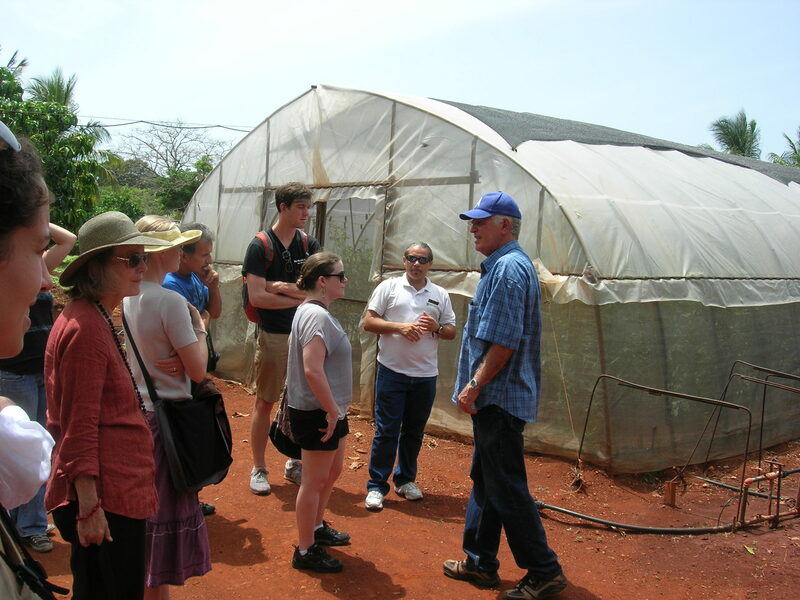 My tour, a joint offering from Food First, Global Exchange/Reality Tours, and Amistur, focused on Cuba’s developing agro-ecological food system. 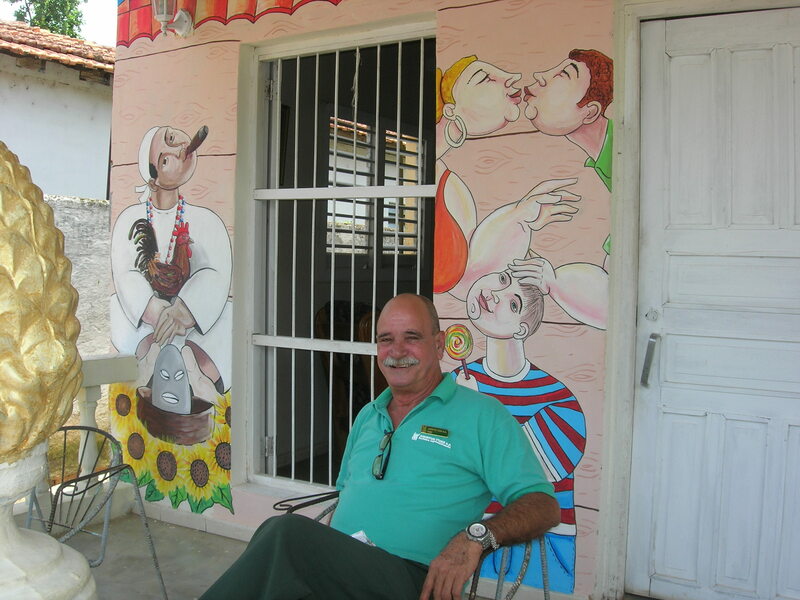 I learned so much!—Over the next few posts I’d like to take you with me to the foundations, farms, neighborhoods, and small enterprises that we visited, and introduce you to some of the Cubans whose labors are building the system. Actually, Day One was supposed to be Saturday July 7th, but we spent it in the Cancun airport waiting for our Cubana flight; we finally go to our Havana hotel at about 5:00 Sunday morning. So we dumped our early Sunday-morning plans and slept in. But we re-grouped around 11:00 and set off for UBPC Alamar, in the suburbs of Havana. 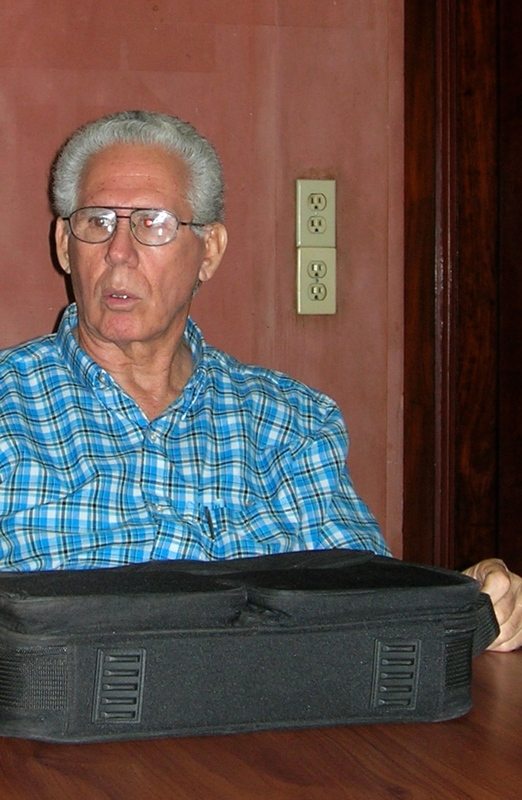 A “UBPC” is a “basic unit of cooperative production,” one of several organizational structures of farms in Cuba. 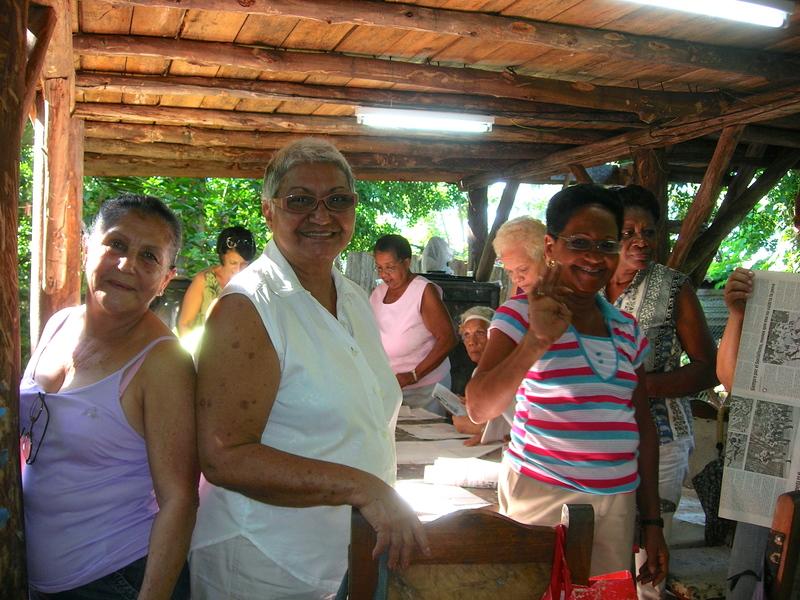 The story of the origins of the UBPCs brings together a number of themes that will come up again and again as we learn about Cuban agriculture. The story, like so many others here, is a story of cataclysm and recovery. Up until 1989, Cuban farming was organized into large state-owned agro-industrial “green revolution” farms that relied on expensive heavy machinery and large amounts of imported chemical fertilizers to produce mono-crops of sugarcane, coffee, and tobacco. By far the largest trading partner?—The Soviet Union. But in 1989 the Soviet Union collapsed, and so did Cuban agriculture. Once again (as it had after the 1961 US blockade began), Cuba lost 80% of its trade, including the market for its crops and the imports of food that had fed the populace. Thus began the “Special Period” (still continuing today) in which agriculture (among other sectors) underwent radical change. In one such change, beginning in 1993, a number of large state farms were broken up and turned over to cooperatives made up of the farm-workers who had been wage-earners on the land before—thus the birth of the UBPCs. The land itself was granted in “usufruct” (essentially, a long-term lease of the state-owned land). Sustainable agriculture began to be understood as a matter of national security, and organic and agro-ecological techniques began to be adopted. At UBPC Alamar, Miguel Salcines, president of the cooperative, walked us through the good-sized farm with its lush vegetable and herb crops striping the rust-red soil. Here he is explaining their use of irrigation and covered structures (—for shade, rather than for raising the temperature, as we use them here in Seattle; I’m here to tell you that they do not need to raise the temperature. At all. Whew.). By the way, pretty much our entire group is in this photo; there were just nine of us, plus our tour coordinator Zoe and our guide/translator Jesús. 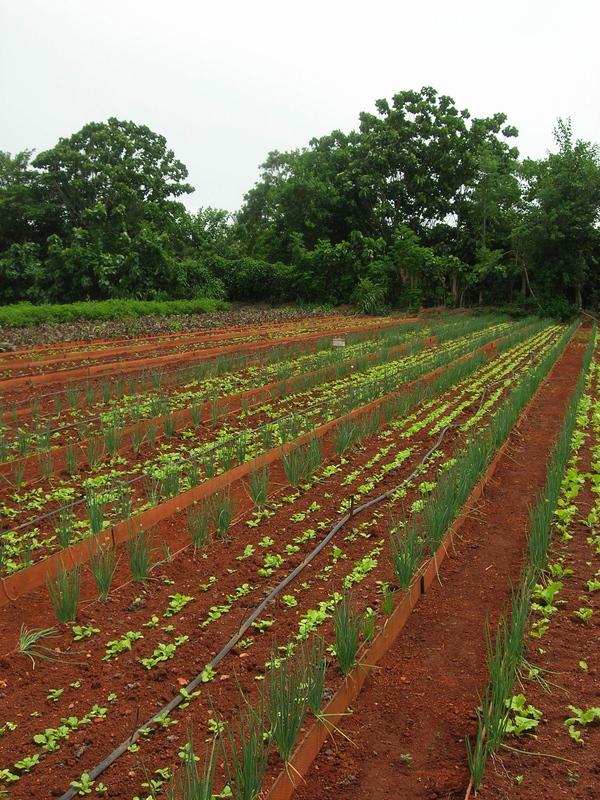 Among the other sustainable practices in use at Alamar are interplanting (here of lettuces and green onions), drip irrigation, integrated pest control, and vermiculture (using worms to turn cow manure into organic matter for compost) . And they aren’t trifling with that operation either; they produce about one ton per day of organic matter, and sell what they don’t use. The cooperative plans to grow; the farmers hold shares in the organization based on the length of time they have been members, and profits are distributed per share. The group votes on policies and practices, and Sr. Salcines told us that their decisions can’t be overruled by outsiders. 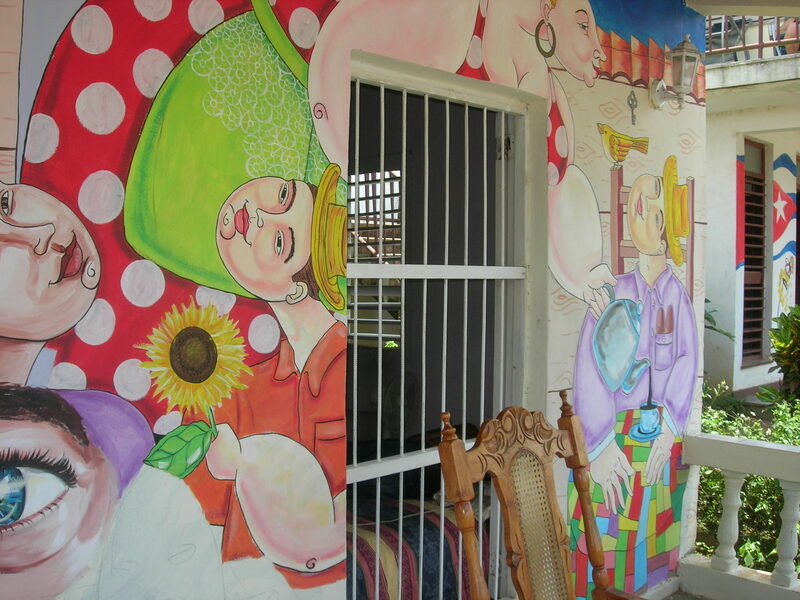 They also have a community mission; they do educational tours and workshops for the local schools. 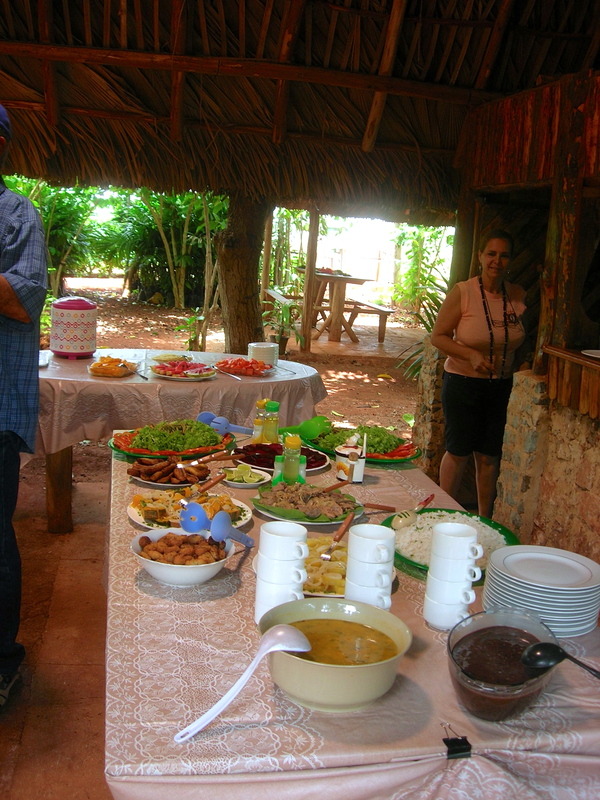 We ended our tour with a delicious meal served alfresco on the farm: fresh plantains, mangos, squash soup, black beans, malanga (a potato-like tuber), fresh juice, and more. We also s aw one of our first instances of the Cuban “make it do” mentality—old bus windows pressed into service in an outbuilding on the farm. 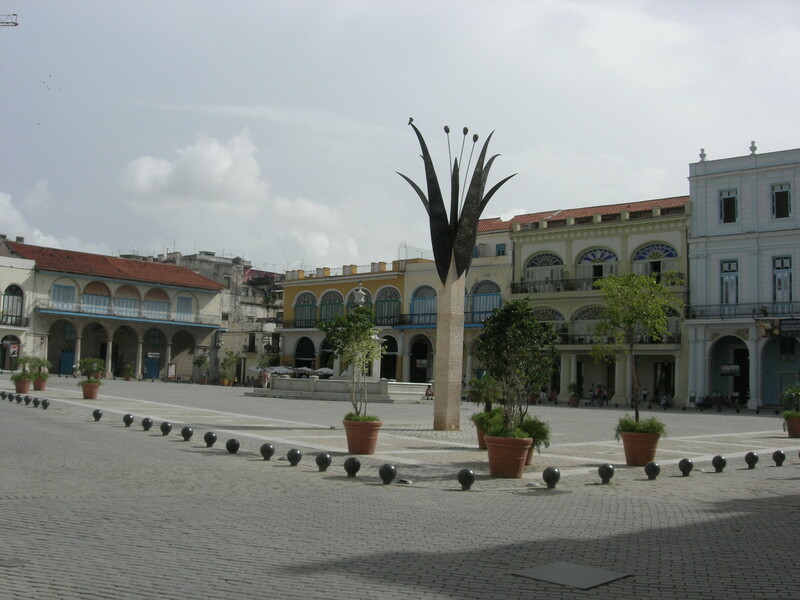 Back in town in the afternoon, we took a little walking tour of the Plaza de San Francisco and Plaza Vieja in Old Havana. 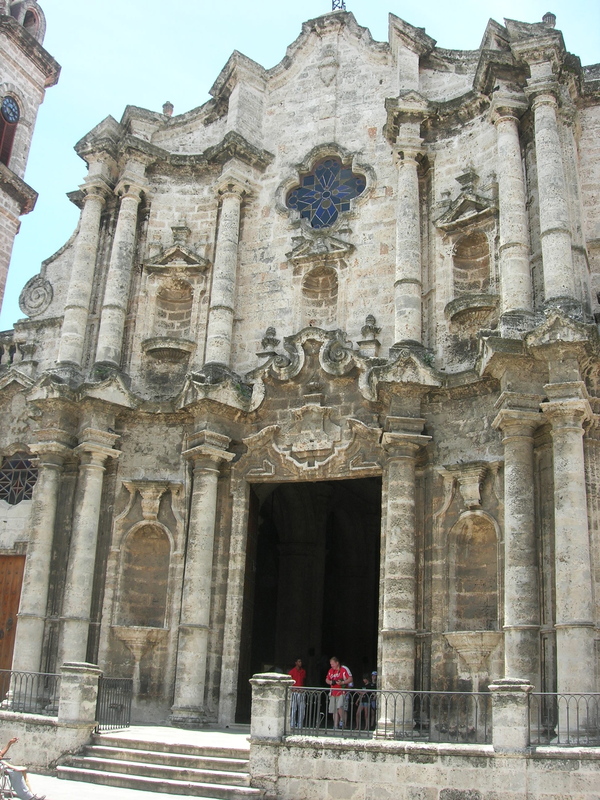 Remember that the Spanish were thriving in Cuba as early as the first years of the 16th Century; Havana’s streets and plazas are as elegant and baroque and wasted as only five complex centuries can make them. 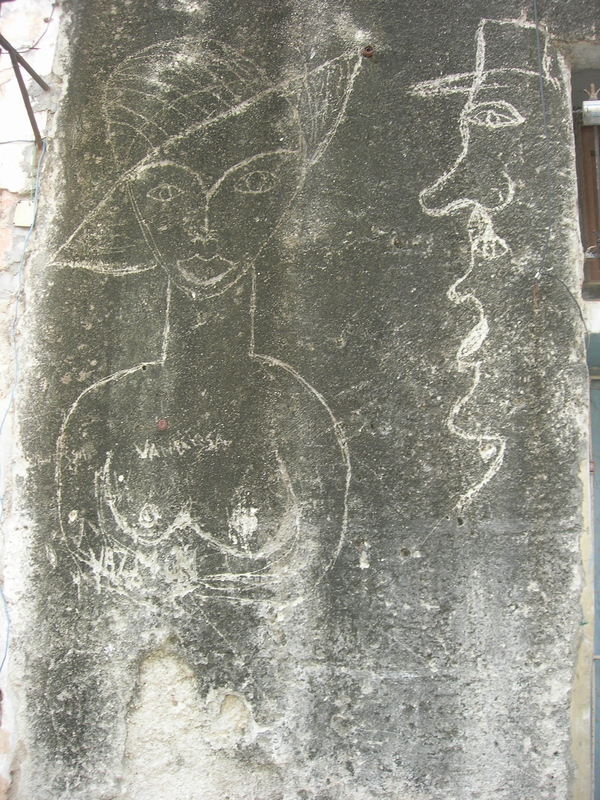 But throughout the twists and turns of our walk, it seemed to me that Cuban wit and creativity winked at us from all sides. 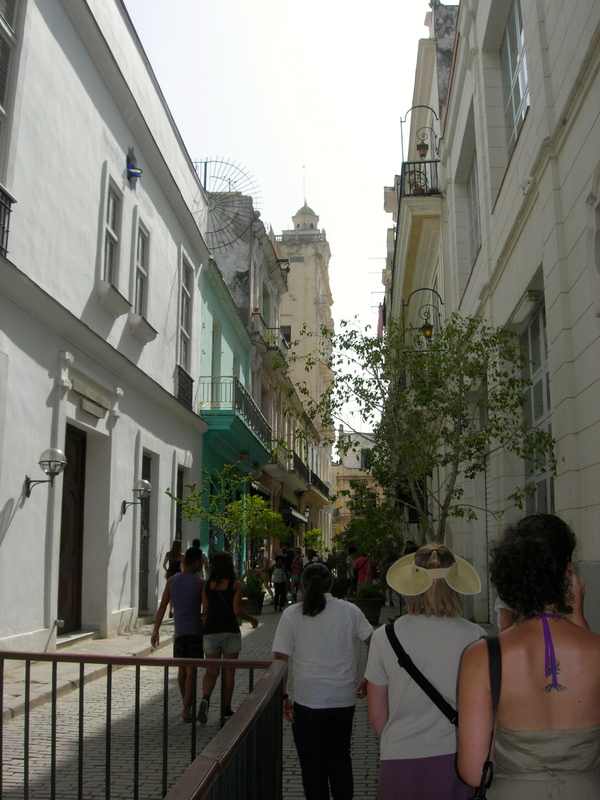 What had we learned so far about Cuba? Here at the end of our first day, I couldn’t say; I found myself distrustful of my own delight in what I was seeing. Was our experience being managed? Certainly. Were the people we were meeting open and analytical and willing to question their own practices? Yes. The one thing I was sure of was that I needed to learn more. Lots of ways to grow potatoes! I grow potatoes in a barrel, and to harvest them I turn the barrel over and scrabble around for them in the dirt-pile. 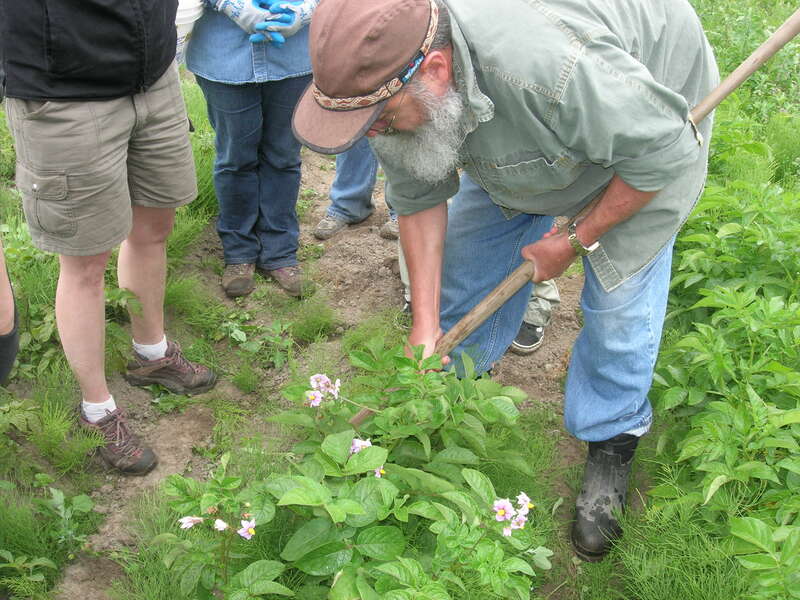 Last year, a class from the Seattle Culinary Academy grew potatoes in mounded rows at La Conner Flats, and harvested t hem with a hoe. 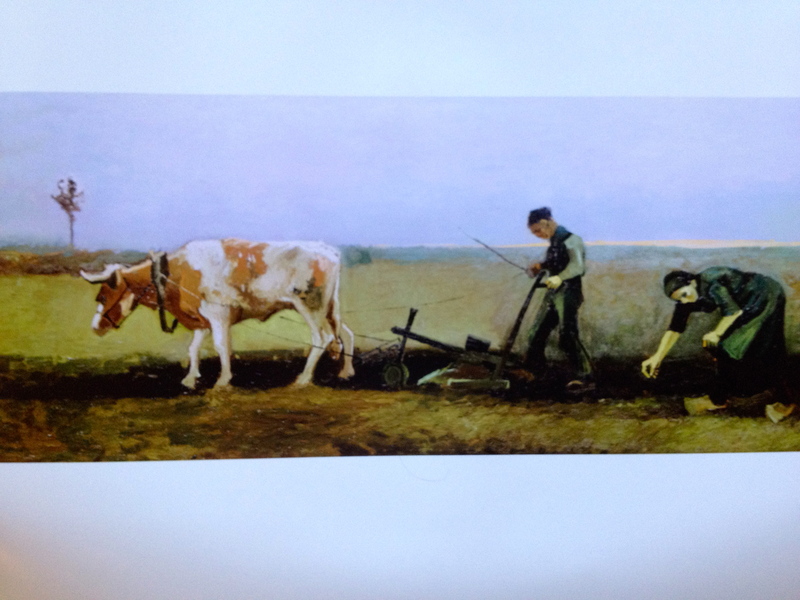 P oor old van Gogh’s peasants trudged along behind an ox, planting potatoes one by one in a long furrow. and probably harvested them with a hoe too. On the edge of a large plowed field behind Kraig’s barn, two huge machines idled. The smaller one began to rumble as it lobbed an avalanche of seed potatoes (potatoes cut into pieces, each piece with an eye) into the bed of the bigger machine. The bigger machine, bristling with tanks and barrels and arms around its bed, loomed above the field on huge tires. Once it had a load of seed potatoes on board, a farmworker climbed into its cab, fired it up, and then, as it lumbered into action, tilted its steering wheel up and sat back with a laptop!—His driving job was done; the real navigator was a satellite a mile or so overhead that was chatting with an innocuous-looking yellow tripod farther down along the edge of the field. But wait, is this industrial overkill? How does this kind of mechanized precision agriculture fit into a vision of a sustainably managed family farm? Kraig had plenty to say on the subject. He pointed out that this technology enables them to get the maximum use out of the land with minimum inputs of fertilizer or other treatments. 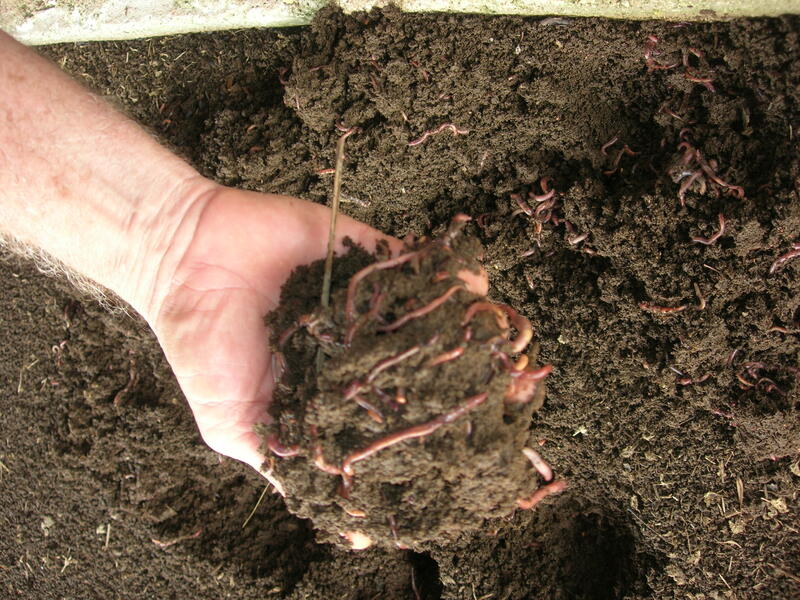 Combined with other strategies like integrated pest management, use of amendments that aren’t residual in the soil season over season, elaborate crop rotation schemes, and so on, the technology is one more tool that enables the Knutzens to fulfill their generation-to-generation mission to be wise stewards of their land. It also helps the farm to be commercially viable, so that the family can look forward to farming their land for the very long run. The Skagit Valley farmers that I have met are a fascinating lot—on the one hand innovative entrepreneurs, on the other thoughtful conservators of their farming landscape. Over the coming months, I hope to introduce you to many more of them!—Stay tuned! 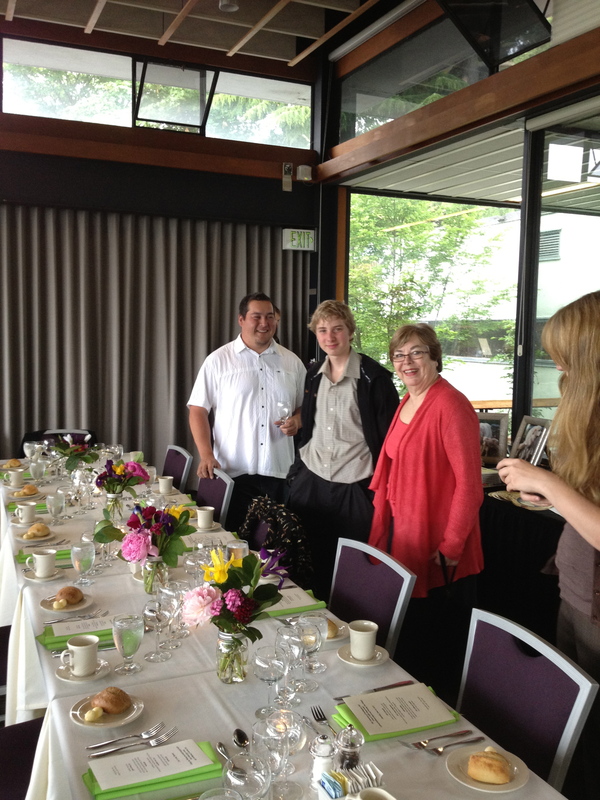 UW Club’s Farm to Table dinner: Beautiful lamb, beautiful wines! Who doesn’t love an excellent dinner prepared with great skill from first-rate ingredients? But to appreciate it even more, just catch a glimpse of the complicated journey made by all those ingredients from the field to your plate. 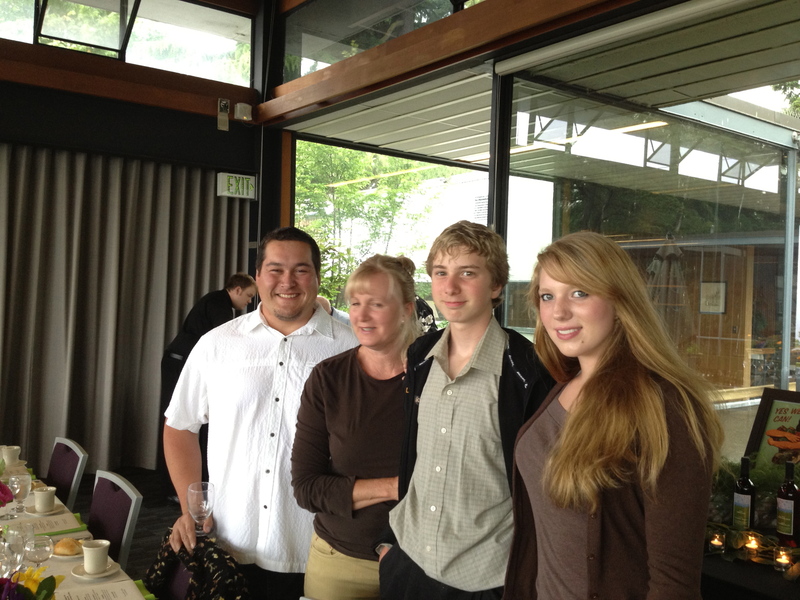 At the UW Club’s Farm to Table dinner, we got just that chance, to see our meal through the eyes of the family that raised our lamb and the family that made our wines. An eye-opener! Paulette Lefever and her two kids Madison and Conor sketched a picture of life on the Lefever Holbrook Ranch: raising not just lambs but pigs, turkeys, ducks, rabbits, and more; growing vegetables for sale; running a bakery; running a catering operation; and just cultivating as many varied revenue streams as possible, to get the most out of their land and to hedge their bets against losses. Paulette explained that when you are working with 1% profit margins, pretty much everything is a threat, and you deal constantly with the tradeoffs and unintended consequences of “competing goods.” For example, we all value biological diversity and the protection of indigenous wildlife. And we all value humanely raised, naturally pastured farm stock. But guess what happens when that indigenous wildlife is a wolf, and the farm animal out there in the pasture up on the butte is a lamb. It turns out that I’m not the only one who loves leg of lamb. But even in the face of all the challenges, it was clear that Paulette, Madison, and Conor are committed to the choices they have made—humane ranching and the best stewardship of their land. And the quality of the result was evident right there on our plates! We also heard from Takashi Atkins, the owner of Waving Tree Winery, just down the road from Paulette’s ranch. He contrasted his family’s small-winery approach to that of the larger players: not “I know you are going to love this” but “how does it taste to you? Tell me what you think!” Waving Tree produces small quantities and really values engaging in a dialog with customers about how the wines are working for them. And the ones he brought for us were working very well indeed! But now on to that meal. The first course, sliced lamb sirloin crostini with caramelized onions and fig relish, was so appealing that I forgot myself and ate it up before I took a picture for you! So you have to trust me on this: a succulent curl of lamb with sweet onions and small quartered figs nestled together on an oval of lightly toasted chewy baguette. With it, we had Waving Tree’s 2007 Grenache, a rich red with (according to the owner of a better palate than mine!) notes of cherry, dark chocolate, and caramel. Great start! 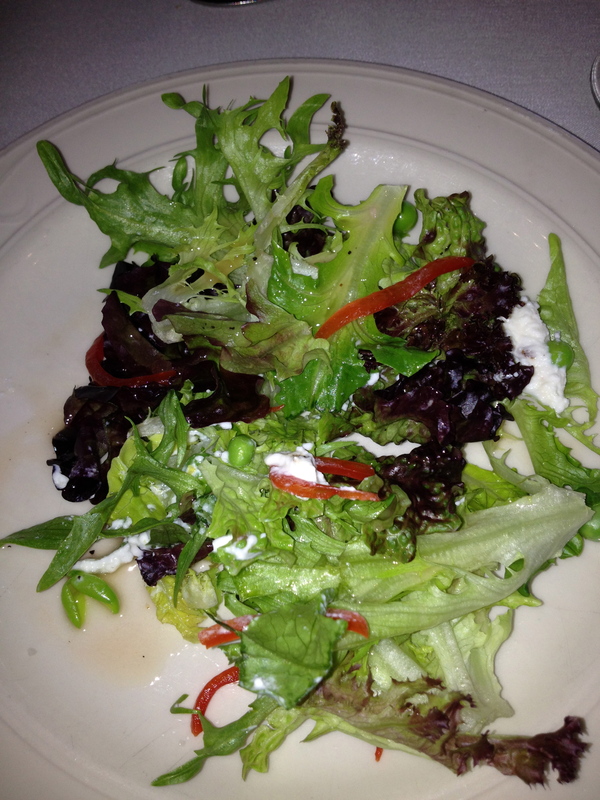 Next up, a lovely salad with spring peas, house-made ricotta, and red peppers in vinaigrette. Fresh tender salad with peas straight out of the pod! But the big surprise for this course was the wine—a sweet (but not too sweet) 2011 Sangiovese rosé. I liked it so much that I bought a couple of bottles and opened one at home on Sunday evening. The mystery of pairings!—It was still very good, but just not as striking with my asparagus-chevre omelette. 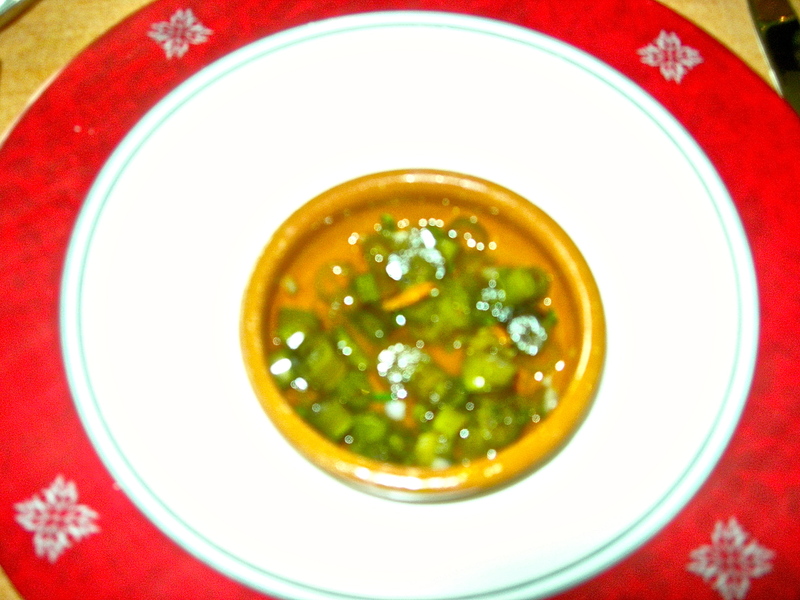 But then on Monday it went really well with a hot stir-fry of my snow peas with red peppers in sesame oil. Go figure. So! Now on to the main event—the leg of lamb. I have to quote the menu: “nicoise olive tapenade rubbed leg of lamb stuffed with seasoned house-ground lamb served with a garlic lemon zest au jus.” The earthy duet of olives and lamb was balanced by the lemon, and the ground lamb stuffing was really unusual—don’t picture hamburger!—Closer to a smooth paté or dense mousse. Yes, there was a small salad there on the plate too—field greens in a vinaigrette with cute baby carrots cut lengthwise—and some roasted small potatoes, and a dab of kale, all lovely. 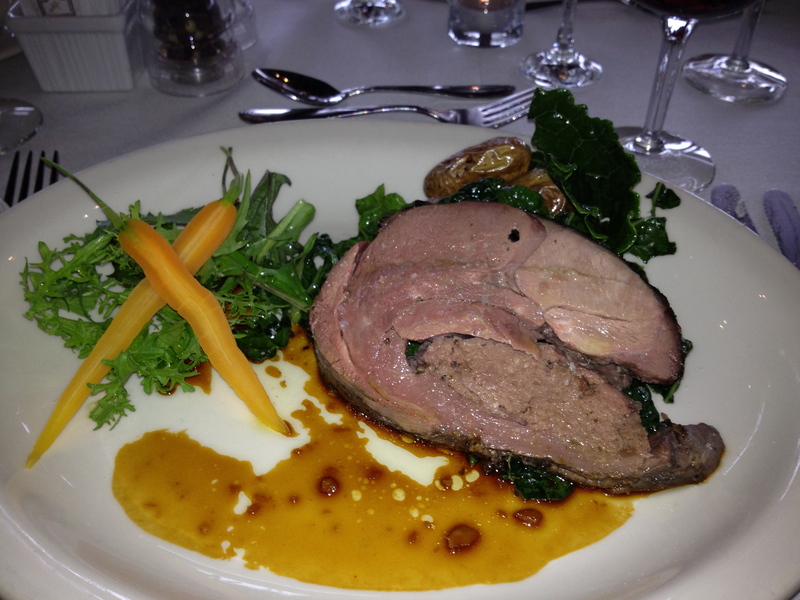 But the lamb au jus!—To die for. We had a 2008 Barbera with it, which had the body and complexity to hold its own very nicely with the rich lamb. Dessert? 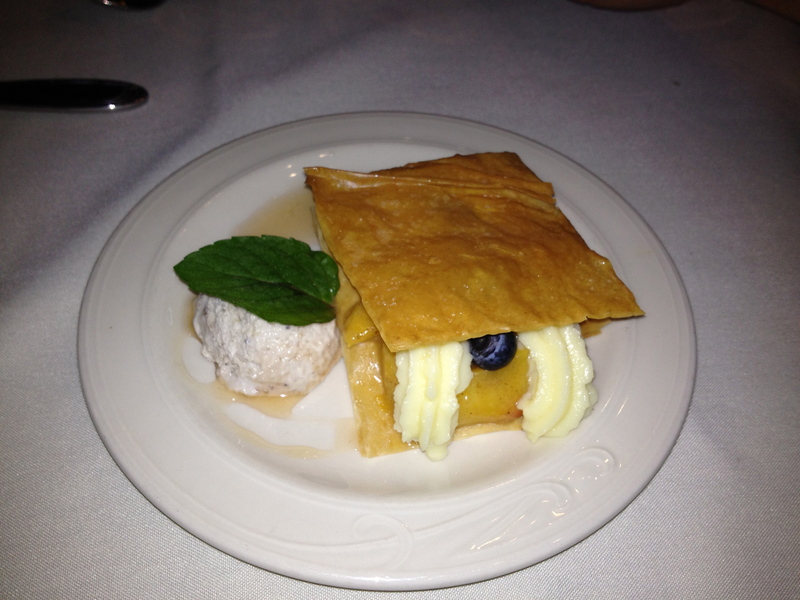 A fresh fruit Napoleon with a little scoop of sorbet, very refreshing! And it was paired with the 2011 Muscat Canelli, a sweet white wine perfect with the fruit and berries. Another excellent meal from UW Club manager Alex Chordas, executive chef Jon Maley, sous chef Jeff Soper, and chef Mike Hoffman! I’ll have more to say in upcoming posts about Paulette, Madison, and Conor and the Lefever Holbrook ranch; stay tuned! And if you’d like to sample Takashi’s Waving Tree wines, visit the website or the tasting room in Kirkland (11901 124th Ave. NE;425-820-0102).